Note: I am returning to Costa Rica in December 2018 for another amazing photo adventure. Join me there. Info. I have been to Honduras seven times, and to Panama twice, but until this past October, I had never been to Costa Rica. 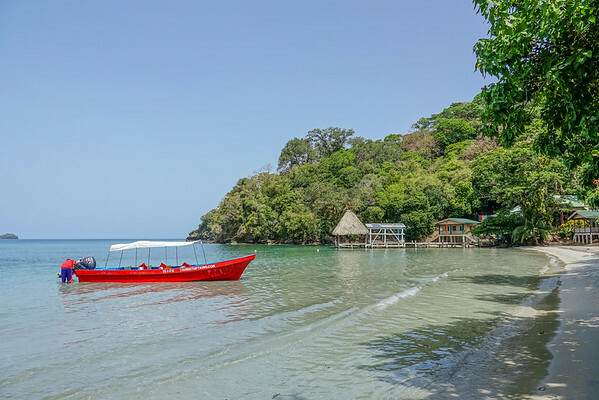 No Central American traveler or photographer can afford to miss Costa Rica. 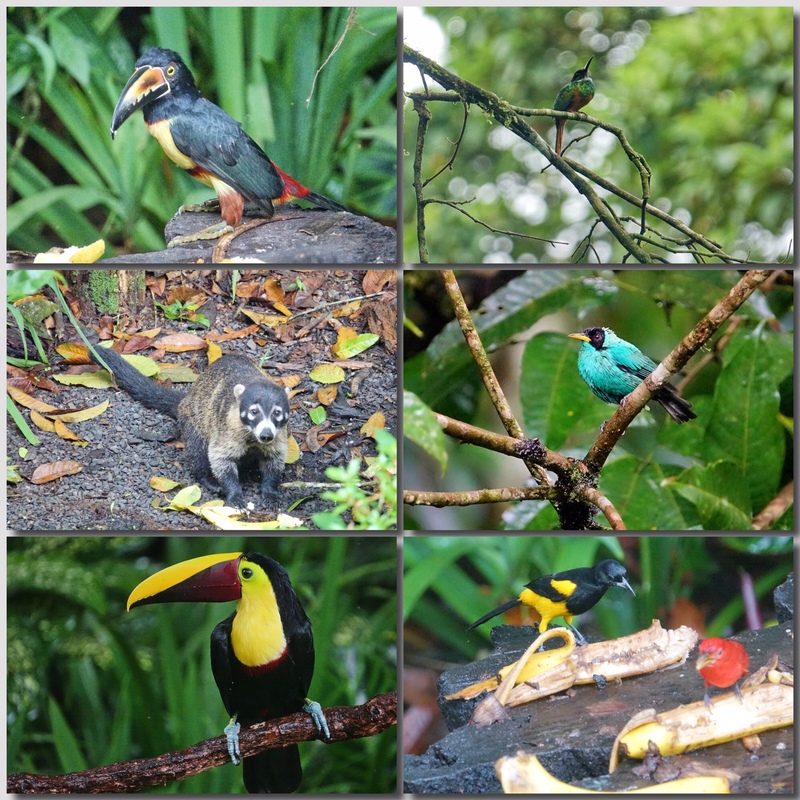 Costa Rica offers rich and diverse bird and wildlife in a country with a well developed ecotourism structure, and an eco-friendly ethic that produces some of the finest observation and photography opportunities to be found in Central America. The lodges are well established and comfortable, the roads are, for the most part, good, there is a whole industry devoted to getting tourists around, the people are friendly, and at least the ones I met, are used to dealing with people who have come to enjoy the experience of wild Costa Rica. And Costa Ricans are proud of their country. They have more land devoted to National Parks and Reserves than most “developed” countries (over 25% of their country is within the National Park System), and their wildlife protection laws, mostly enacted a generation ago already, are a model for their neighbors. They take birds and wildlife, and those who come to see and photograph it, seriously. My trip to Costa Rica was arranged by Holbrook Travel (http://www.holbrooktravel.com/), and for most of my visit we stayed at Selva Verde, a rainforest lodge owned and operated by the Holbrook family. (http://www.selvaverde.com/ ) While the lodge itself offers great wildlife and birds, and many excellent photo opportunities, most days we went out to other well known birding and photography hot-spots in the valley of the Serapique River, and the surrounding foothills. The last three days I, and two other members of the group, went up into the mountains to the Savegre Hotel for an experience of the cloud forest and its birds (http://www.savegre.com/). 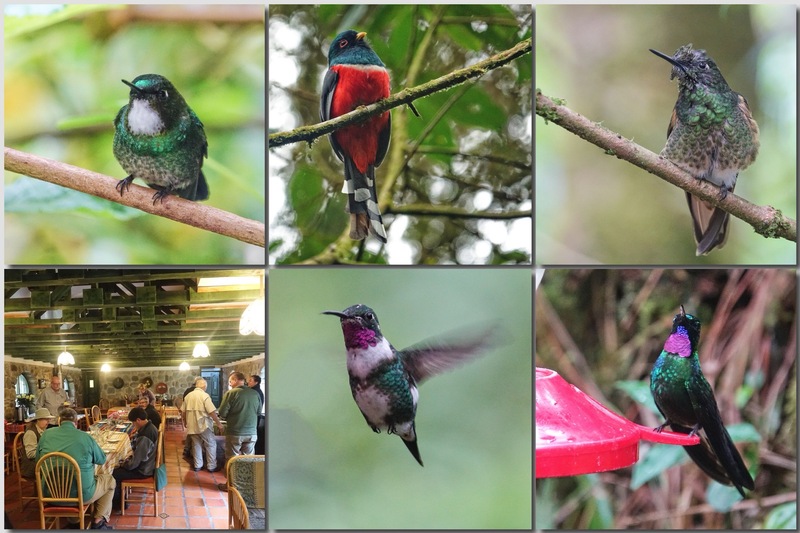 Bronze-headed Emerald, a Costa Rican endemic, Red-headed Barbet, Green Thorntail, Purple-throated Mountain Gem, Black-bellied Hummingbird and the upper falls, all at the La Paz Waterfall Gardens in the mountains above San Jose. 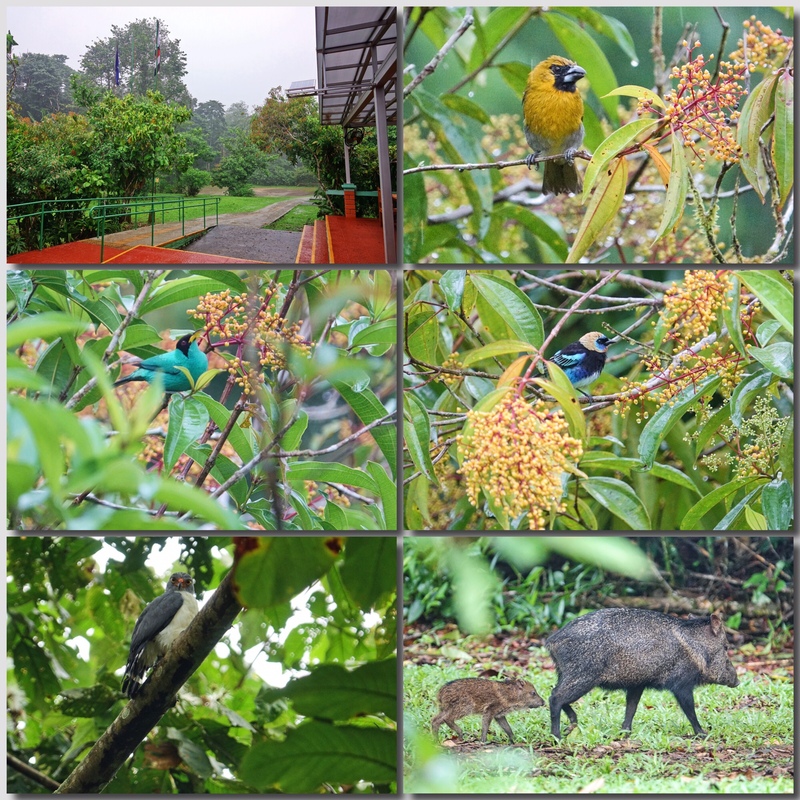 Around the feeders at Selva Verde: Collared Aracari, Rufous-tailed Jacamar, White-nosed Coati, Green Honeycreeper, Yellow-throated Toucan, Black-cowled Oriole and Summer Tanager. 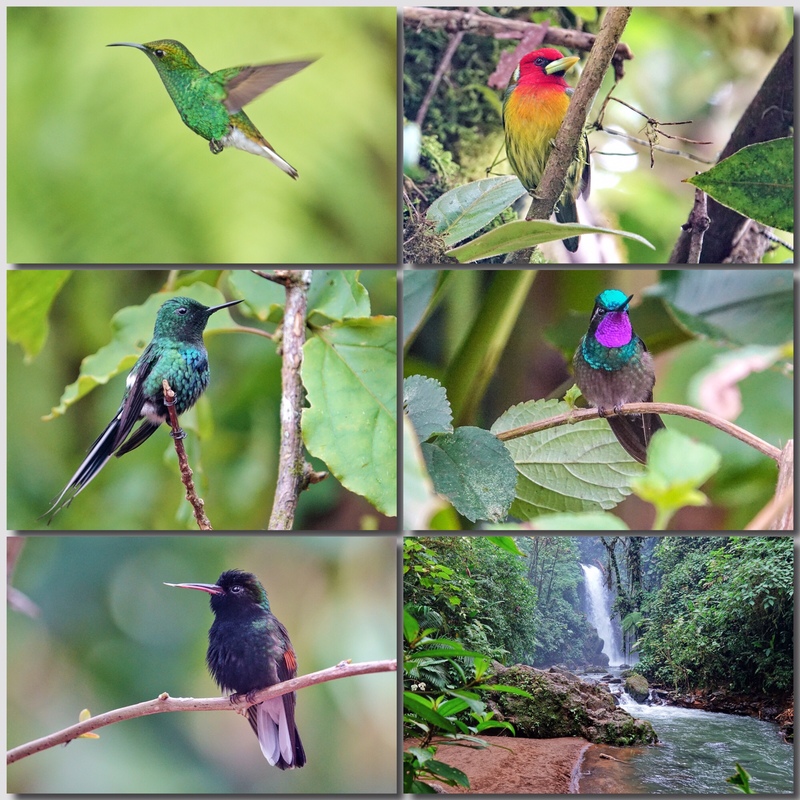 One of the most attractive aspects of birding and photography in Costa Rica is the number and variety of birds that come to the feeders and frequent the grounds at the lodges and private reserves. Selva Verde had three kinds of Toucans, at least a dozen bright Tanager species, woodpeckers, Variegated Squirrels and a White-nosed Coati coming to the feeders. There were Howler Monkeys in the trees above the cabins every day, and White-faced Caputians across the street in the gardens. There were also Motmots in the Gardens. Before we even got to Selva Verde we visited the La Paz Waterfall Gardens on the mountain rim surrounding the high central valley and San Jose, where we saw a dozen different species of hummingbirds around the feeders and our first Barbets. 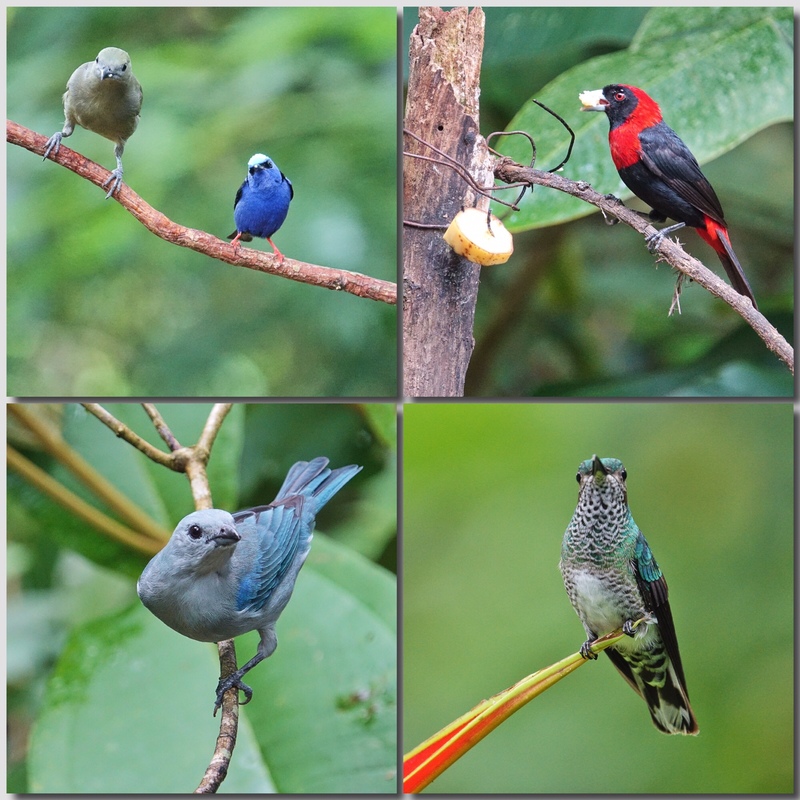 Dave and Dave’s Costa Rican Nature Park, quite near Selva Verde lodge, has an array of carefully managed, natural looking, feeding stations that attracts Tanagers and Toucans, as well as a variety of rainforest hummingbirds. One afternoon we visited Cope, a native artist in La Union de Guápiles about 45 minutes from Selva Verde (http://copeartecr.com/) who not only showed us a Crested Owl in the rainforest, but took us back to his home, which he has transformed to something between a wildlife sanctuary and an outdoor photo studio, where he showed us all kinds of unique and interesting creatures, including a Glass Frog and the very rare White-tipped Sicklebill (hummingbird) which happens to come to his feeders. 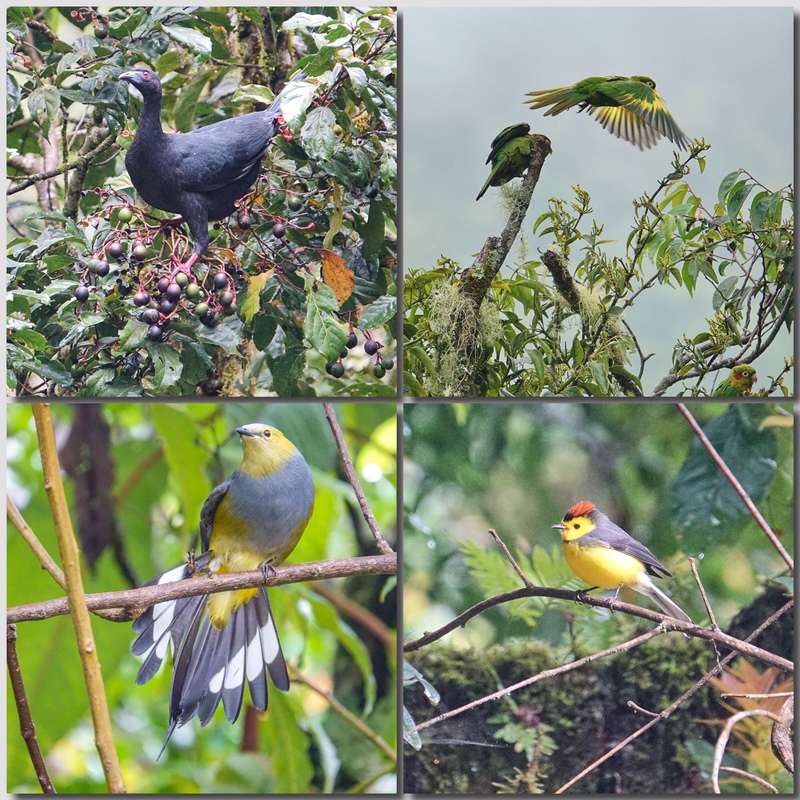 La Selva Biological Research Center is one of the most famous birding locations in Central America (or the world depending on who you talk to): Our day there was rainy and dark, but we still saw interesting birds right outside the restaurant patio. Black-faced Grossbeak, Green Honeycreeper, and Golden-headed Tanager. 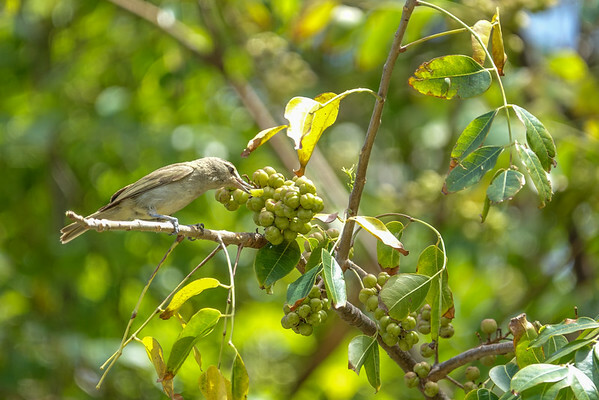 La Selva is one of the reserves that does not feed birds, but the native plants bring the birds in just the same. We later walked the paved forest trails and found this Semiplumbeous Hawk, and, near the research residences, a Collarded Peccary with young. Another factor that makes Costa Rica such a great ecotourism destination is the ease of access to such a wide variety of habitats. There are lodges, hotels, and reserves in every region, from dry forest in the north west, to the rainforest of the Caribbean lowlands, to the mid-level forest on the volcanic rims in the coffee country, to cloud forest at the higher elevations…all accessible by well maintained roads. And much of it is no more than 2-3 hours from San Jose’s international airport. With Cope in the rainforest to find the Crested Owl and Honduran White Tent-making Bats, and then at his home for some exotic photography. He had collected the frogs the night before (Glass Frog and Poison Dart Frog) and set them up in his outside studio for natural looking shots. The White-tipped Sicklebill, one of the rarest hummingbirds in Costa Rica, comes to his feeders daily, and he has been photographing this big male Basilisk Lizard for over 10 years. And everywhere you go, the people of Costa Rica are ready to show off their country and their wildlife. Near Savegre Hotel there is a tree up on a hillside that is famous for its Resplendent Quetzals. Right tree, right place. The farmer who owns the land has built a rough trail up the all but vertical slope, complete with hand-rails, and chopped out a platform on the hillside across from the tree where birders and photographers can stand to watch and photograph the Quetzals as they come in to feed. The day we visited, he met us at the foot of the trail and accompanied us up to the platform, as delighted as we were with the birds, though he sees them every day. He collects a small fee from birders and photographers who want to see “his” Quetzals, that helps his family to survive (hopefully more than survive) and gives him incentive to keep the land as natural as possible. He could easily rip out the wild avocado trees otherwise, and plant coffee or corn. 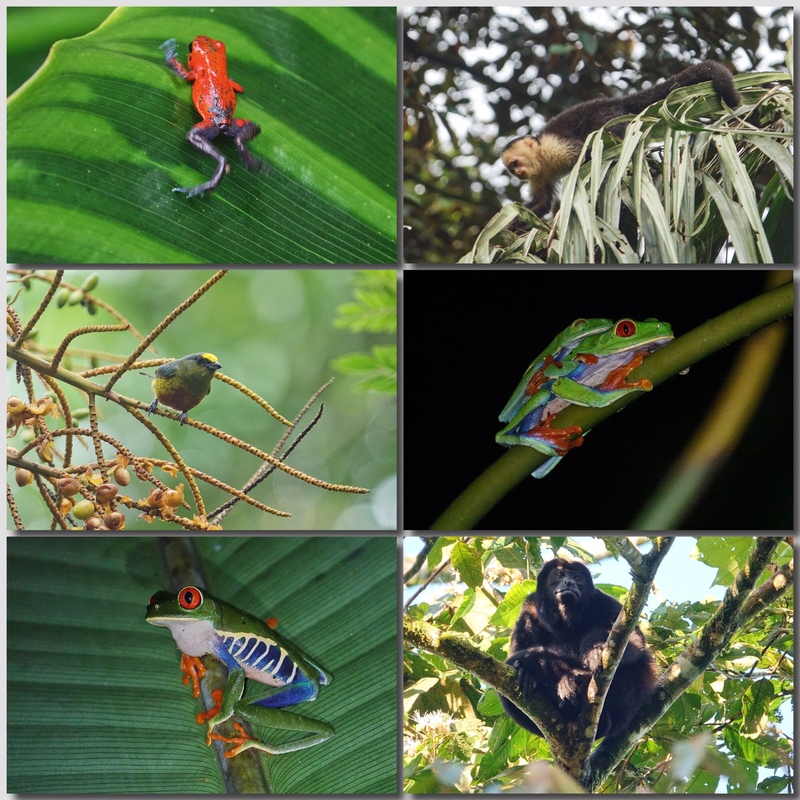 Dave and Dave’s Costa Rican Nature Park is a small private reserve with exceptional photo opportunities. 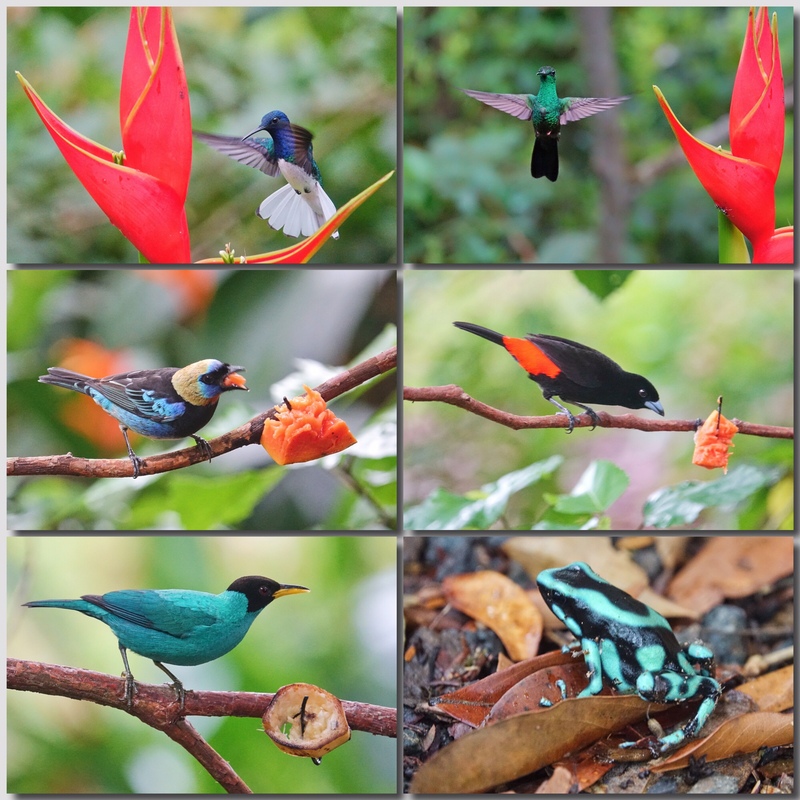 White-necked Jacobin at Heliconia flower, Bronze-tailed Plumeleteer, Golden-headed Tanager, Passerini’s Tanager, Green Honeycreeper, Poison Dart Frog. All of the native guides and naturalists we met and worked with were well trained, knowledgeable, and delighted to be of help in our understanding of what we saw and experienced. 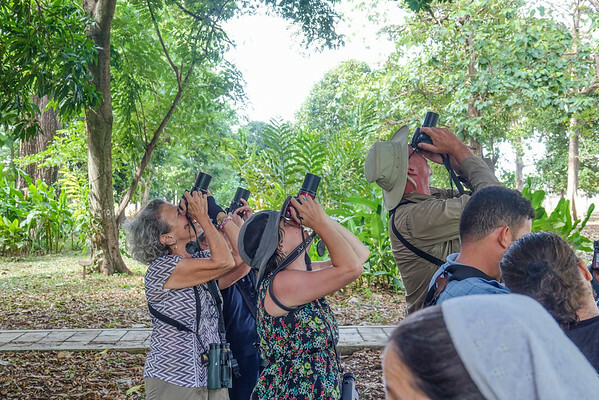 Costa Rica does have an extensive and through guide training program that includes ornithology, biology, botany, geography, history, ecology, and first aid…and, of course, the interpreters at the official research stations are generally graduate-students or research assistants, experts in their fields. 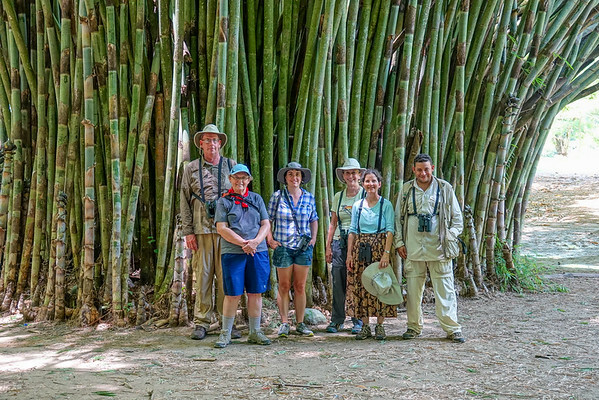 If you work with an experienced tour company like Holbrook, you can be confident that you will be in good hands while in Costa Rica. 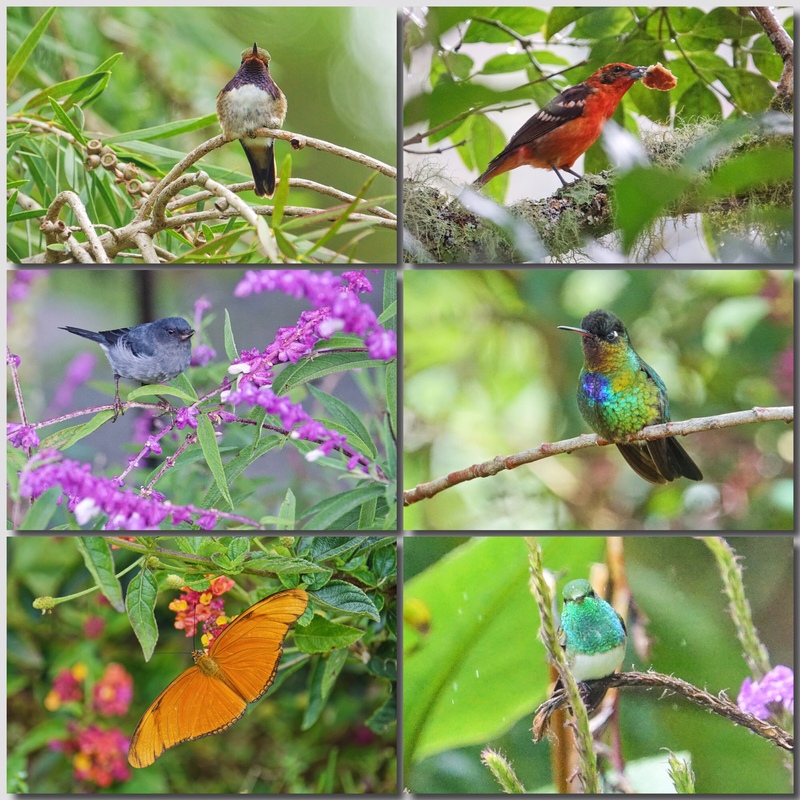 Cloud Forest and mountain specialties around the Savegre Hotel: Volcano Hummingbird (another Costa Rican endemic), Flame-colored Tanager, Slaty Flowerpiercer, Firey-throated Hummingbird, Julia Heliconian, Snow-bellied Hummingbird. I was impressed enough with the potential (and the reality) of Costa Rica to plan to return with another group next year. I can not imagine any birder or photographer going there and not wanting to go back. A amazing country, amazing wildlife, an amazing experience, and amazing memories. That is what Costa Rica has to offer. 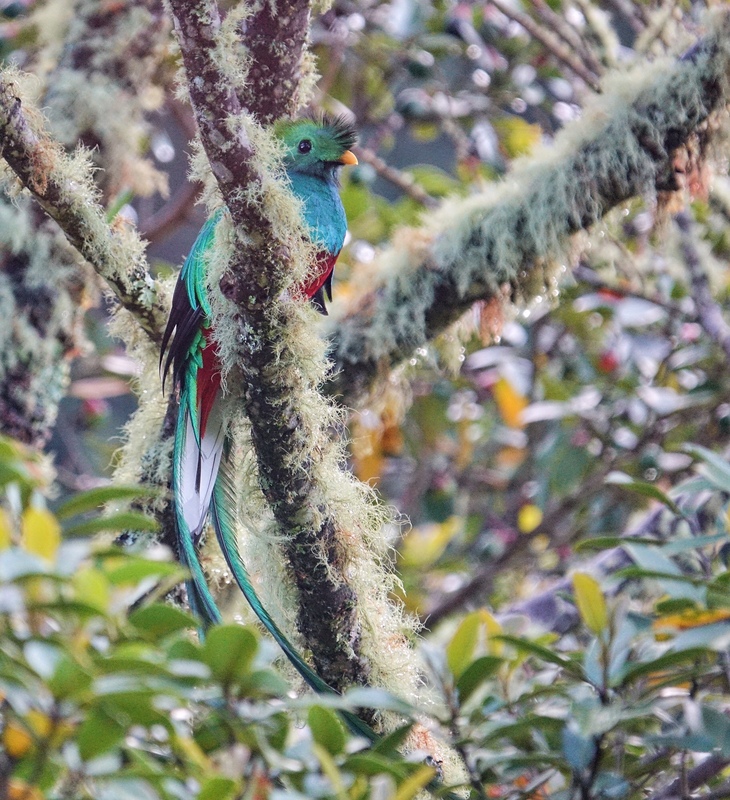 Resplendent Quetzal, near Savegre Hotel in the cloud forests of Costa Rica. Worth the trip all on its own. All of the photographs in this article were taken with the Sony RX10iii and processed in Polarr on my iPad Pro. 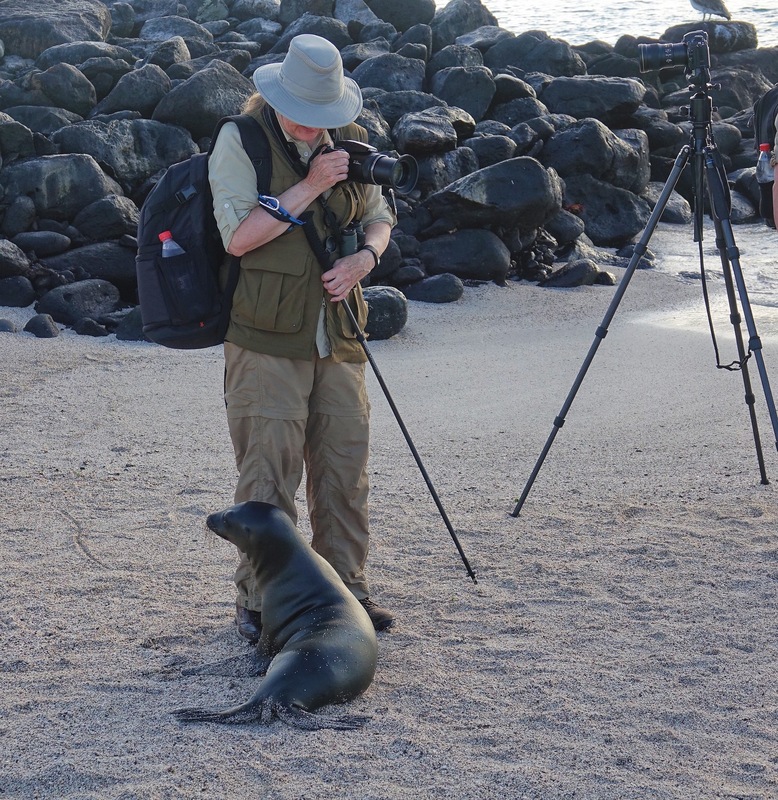 The Galapagos has to be on any nature photographer’s short list of most wanted places to go…it is on the bucket list for those who simply appreciate nature, and many a pure tourist longs to tick it off the list. I know it is a cliche but there is truely no place like it in the world. The Galápagos Islands sit right on the equator, in the middle of the Humbolt Current, just far enough off-shore from Ecuador to maintain a totally unique habitat. 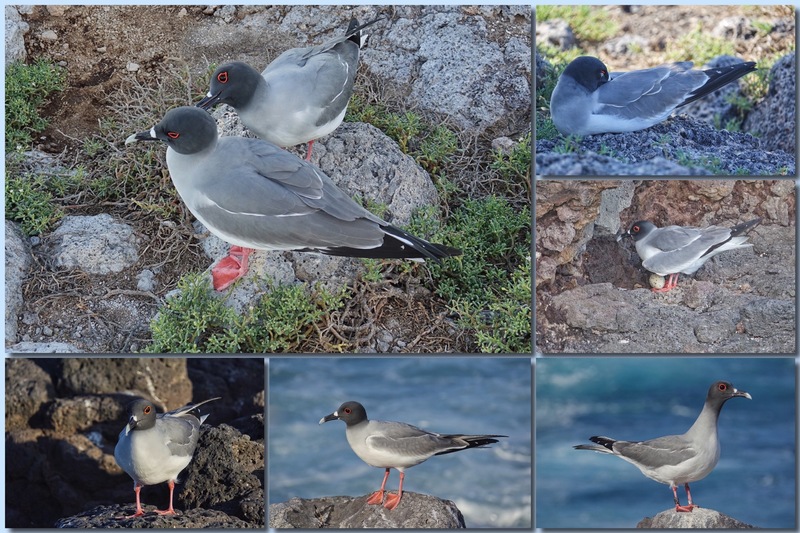 There are certainly birds and animals there that you can see no-where else…but the real magic is in how close you can approach all of the island residents. Combine that with some of the most stunning seascapes and landscapes imaginable…sunrise to sunset…and why wouldn’t anyone want to travel there? Since I was already in South America for the Wildside Nature Tours Amazon Riverboat Adventure, I was also invited to participate in a special, small-boat, 7 day trip to the Galapagos. Kevin Loughlin, the major partner in Wildside Nature Tours, does the islands at least twice a year. Our trip was his 24th. He knows the best boats, the best guides, and the islands themselves as well as anyone in the business…better than most. 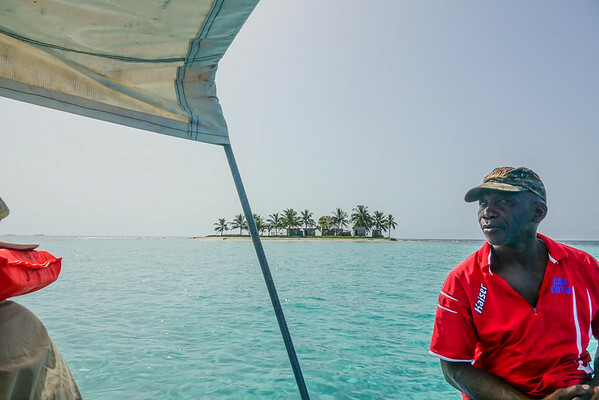 His tours, generally limited to 12 people, spend more time ashore on the islands than any others. Land time on any island is limited to 4 hours per boat, and no more than 20 people. We got to spend the whole 4 hours on each trip ashore, while most boats had to fit several groups in that same time frame. We got to sit with good subjects for the perfect shot, and take all the time we wanted to appreciate the scenery. On this trip again, I used only the Sony Rx10iii. It’s 24-600mm zoom covers the ideal range for the islands. Much of the time I had to zoom back from 600mm. The birds and animals were just that close. And the Sony in-camera HDR was perfect for the sunrise and sunsets, and the amazing island and seascapes. Then too, most of the other folks on the trip were carrying 20-40 pounds of camera equipment ashore each day. My Sony, with the same kind of capability as their whole outfits, was much easier to carry, and fit in a small wet-bag for the wet landings. I really appreciated it by the end of 4 hours in the equatorial heat of the islands. We spent our first night in Ecuador at the Garden Hotel near the airport in Quito. Wonderful grounds and a great atmosphere. 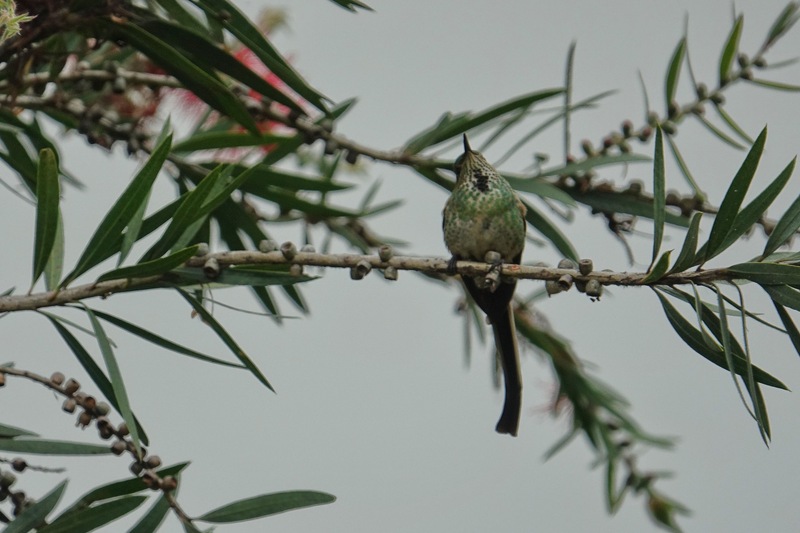 And the first of my Ecuadorian Hummingbirds. The next morning we were off early again to catch a two-hop flight to the Galapagos…though you stay on the same plane there is a short layover in Guayaquil. Having realized the shortcomings of my packing while on the Amazon, I spent the time at the airport in Quito searching, successfully, for a small day-pack to carry my camera on the wet landings (I already had a dry bag to go inside). When we landed in San Cristobal, Kevin advised us not to try to photograph the birds at the airport. Tempting as it was, he assured us we would have better opportunities on the other islands we were to visit. 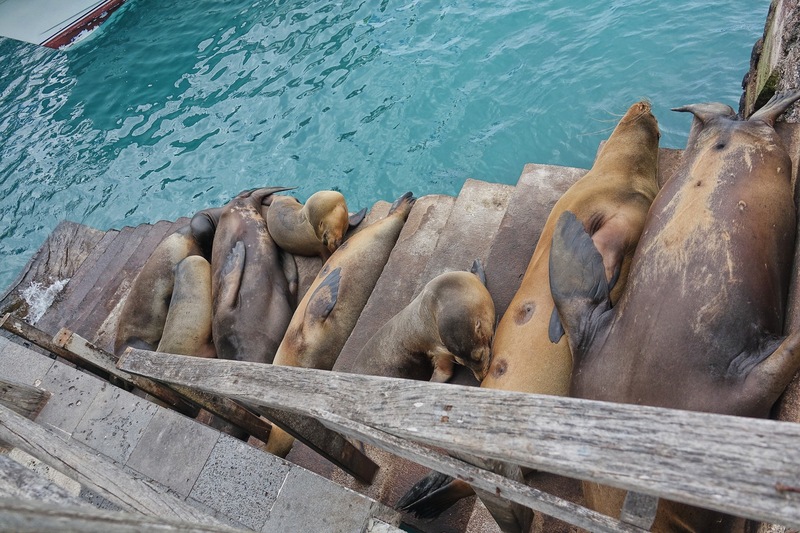 Still, when you get to the dock to board the pangas (rubber zodiac like boats) that take you out to your yacht, it is impossible to resist the sea lions who greet you, or would greet you if they were awake. After room assignments and lunch on the yacht, we returned to San Cristobal to take a bus up over the top of the island for a visit to a Tortoise Reserve and Breeding Station, for our first looks at unique Galapagos wildlife. 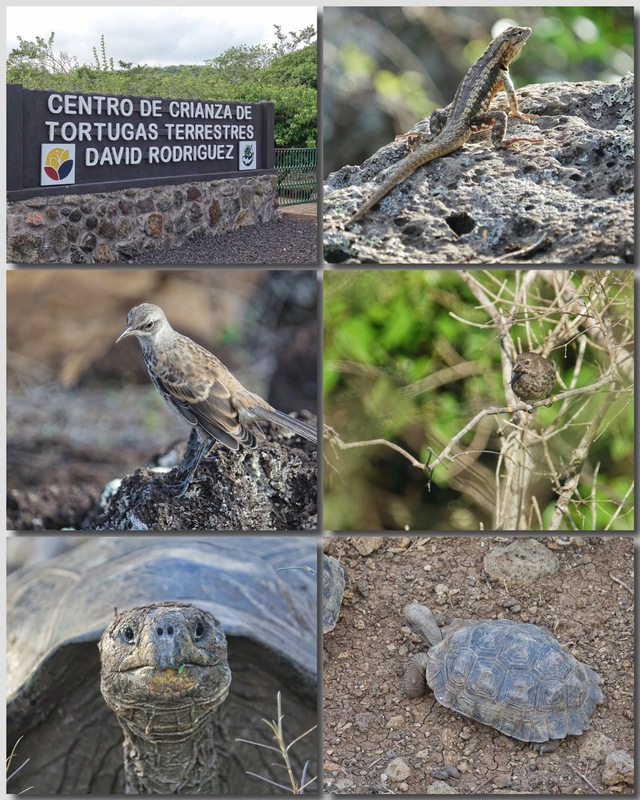 We saw the giant Tortoises of course, but while there we also had our first encounters with one of the 4 species of endemic Mockingbirds of the islands, one of the Lava Lizards, and one of Darwin’s Finches. We returned to San Cristobal town in time for sunset, a little shopping, and back to our yacht for the first of many excellent dinners. To make the most of your time in the islands, the yacht moves at night, while you are sleeping. It takes some getting used to, as the waters around the islands, stirred by the Humboldt Current, can be quite choppy…but it is a small price to pay for paradise. 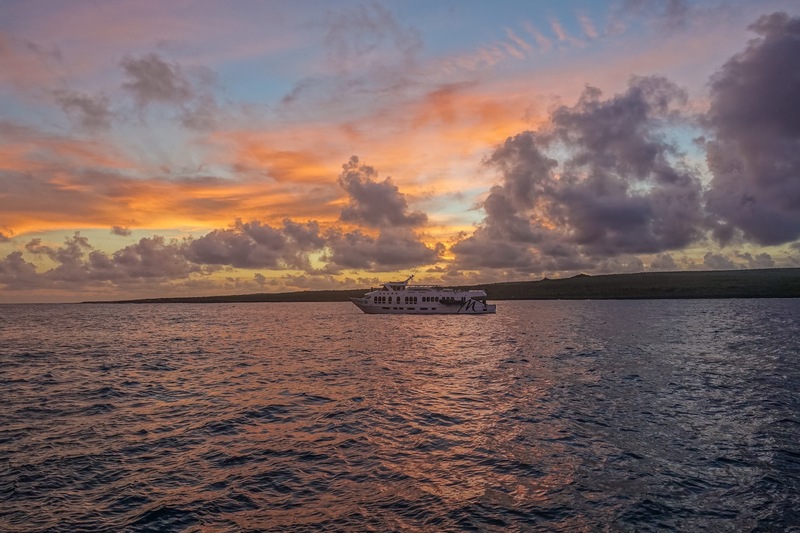 We woke on our first full day in the Galapagos to a stunning sunrise…the first of many…and, after a hearty breakfast, boarded the pangas for a short ride to Espanola Island. 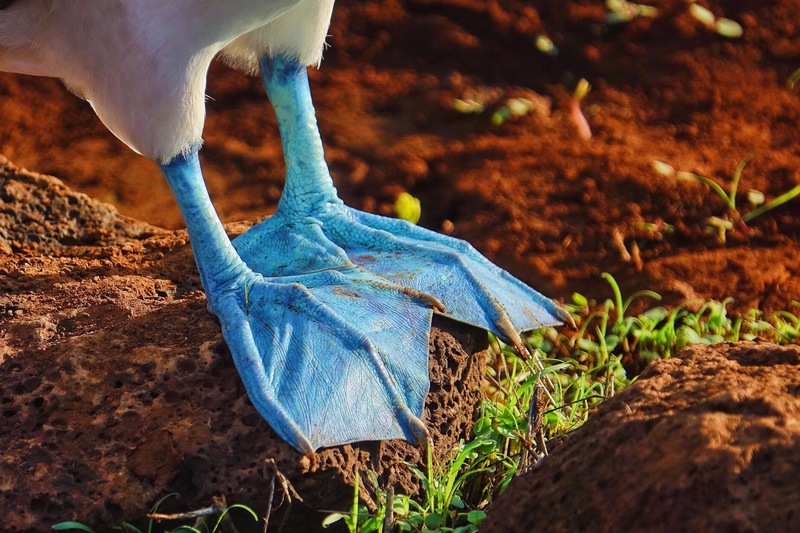 Every trip to the Galapagos is a mixture of dry and wet landings. 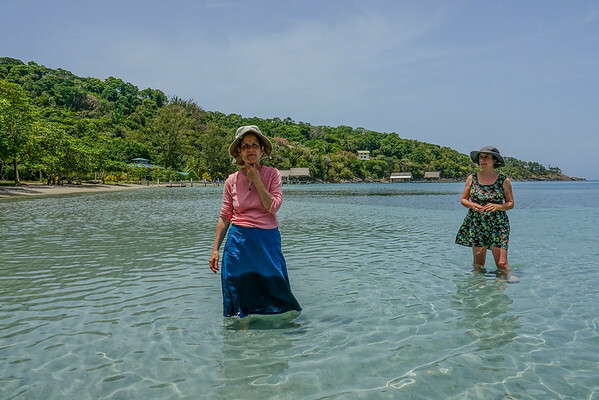 Some islands have landing jetties, and on some you run the pangas up to the beach and climb out knee deep in water to wade ashore. Kevin insists on good wading sandals for the wet landings. I also invested in two pairs of sand socks…lycra crew-style socks with neoprene soles and heels. The sand socks keep the sand out from between my toes and my feet and the sandals. Before the end of the trip could have gotten several times their cost if I had been willing to sell them. Highly recommended. The Galapagos are all volcanic islands, but they are mixture of what I think of as short islands and tall islands. 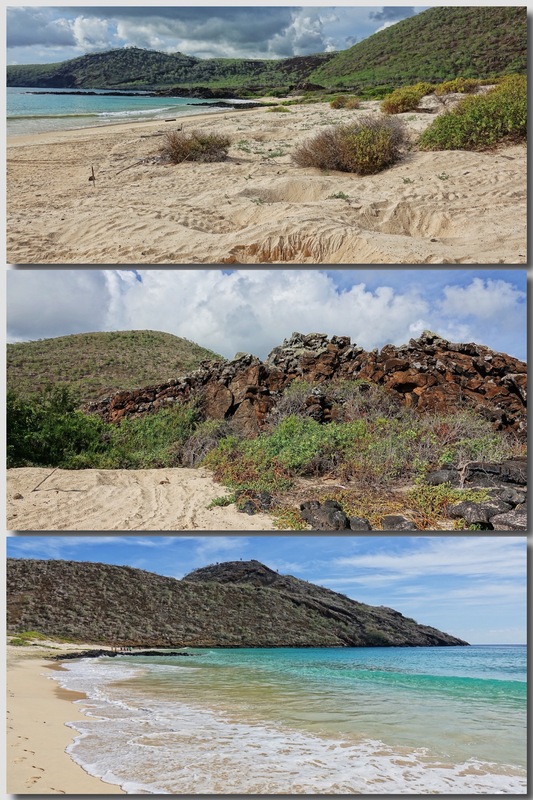 Espanola is one of short islands…essentially a slab of lava raised maybe 70 feet above the sea at its highest point. 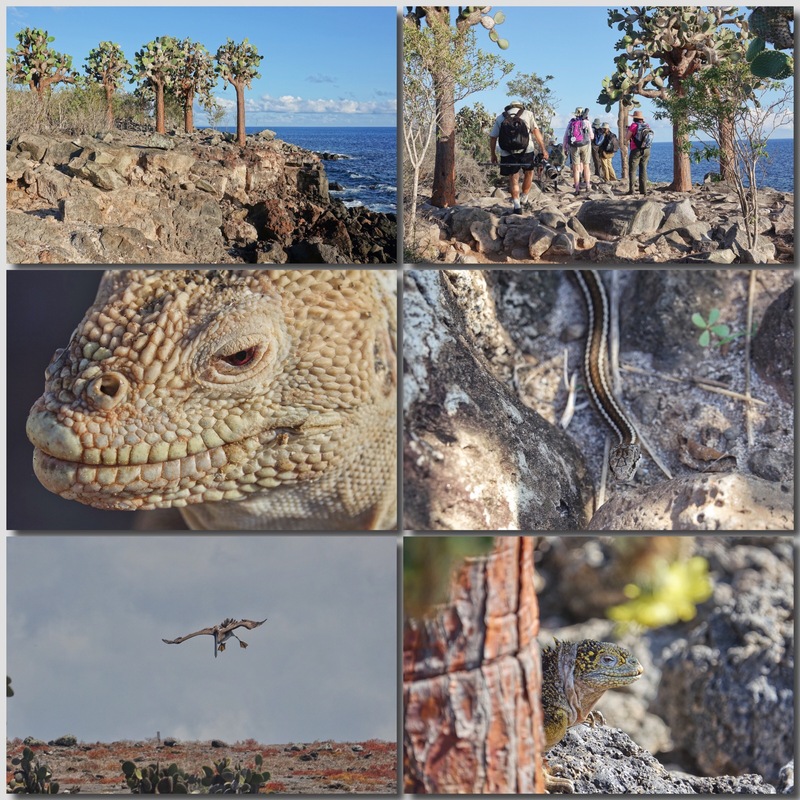 The trails are pretty rough, with loose lava underfoot and no soft landings if you fall…but both the scenery and the wildlife are totally worth the hike. Dawn on the first day. A yacht similar to ours that was on the same schedule as we were. 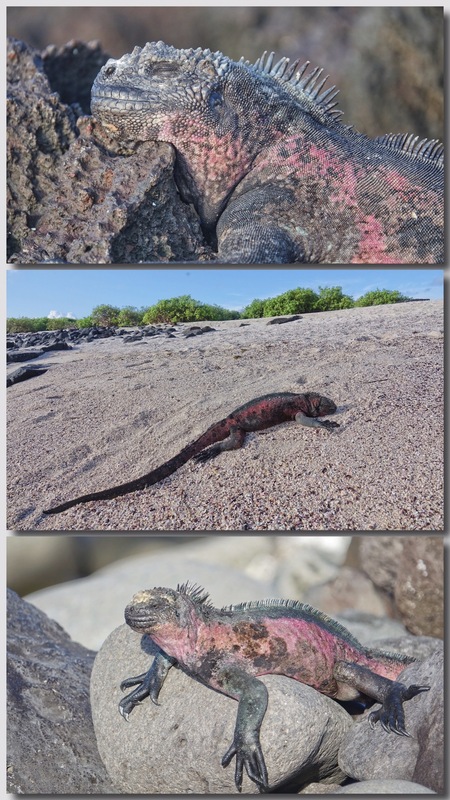 Marine Iguanas. They dive deep in the cold sea to feed on plants and spend much time on land warming themselves. The colors are salt deposits. Each day there were several activities, with snorkeling generally in the late morning after time on one of the islands. I had never snorkeled before this trip, but I came equipped with an underwater camera. Unfortunately after one disastrous attempt I did not get in the water again, so I missed part of the Galapagos experience. Maybe next time…after a few lessons. 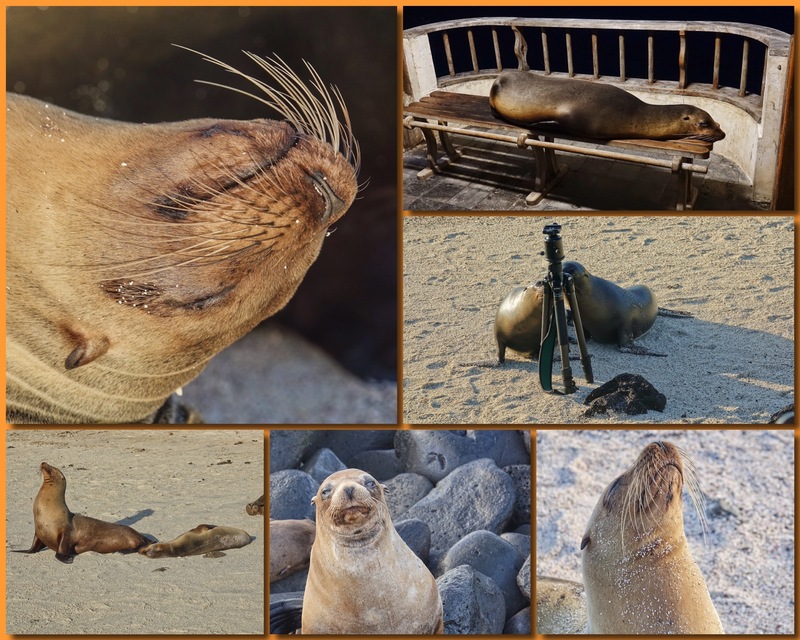 This is as good a place as any to highlight the sealions of the Galapagos. They are everywhere, from tiny pups to great beach-master bulls. They have absolutely no fear of human beings, and on several occasions we had pups come up and get very familiar with both our gear and our persons. 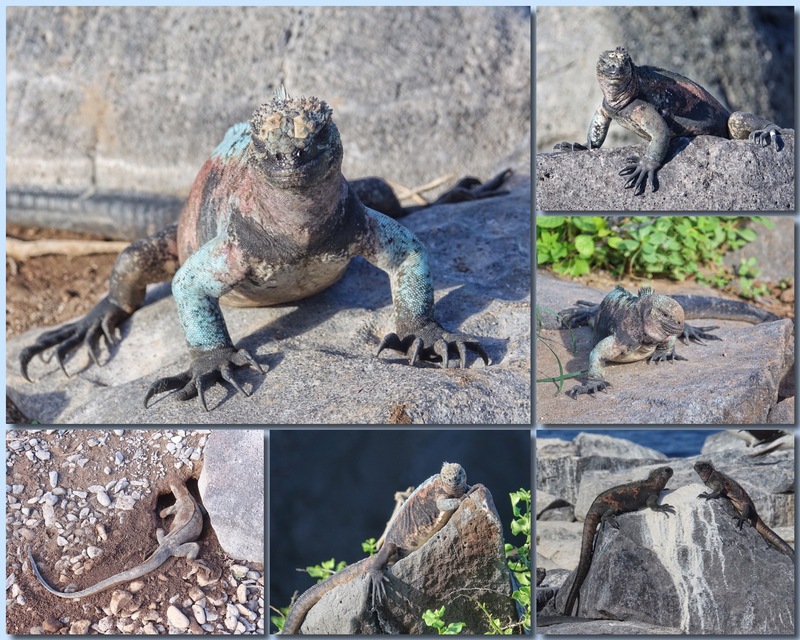 Our next day was spent on Floreana Island, one of the high islands of the Galapagos, and one with gorgeous beaches were Green Sea Turtles nest and rays swim in the surf. We did not see the turtles, but we certainly saw their excavations and tracks on the beach. Turtle tracks on the beach at Floreana, and the surf. In the two panels above you can appreciate the real versatility of the Sony RX10iii (and soon to be iv). Flamingos at 600mm, in flight, and landscapes worth bringing home and showing off. Overnight the boat moves us across the Humboldt Current once more to South Plaza, another short island…and indeed very plaza like. 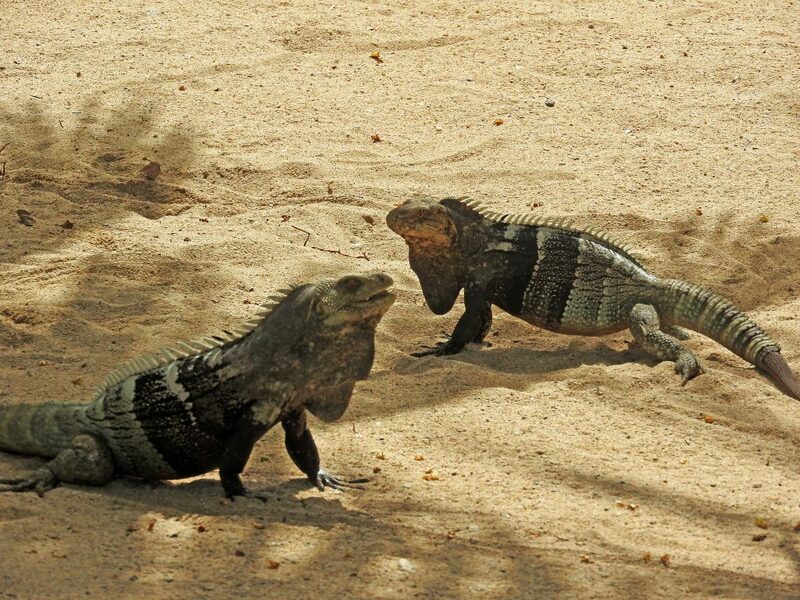 Here we had our fist encounters with the Giant Prickly Pears and Land Iguanas. 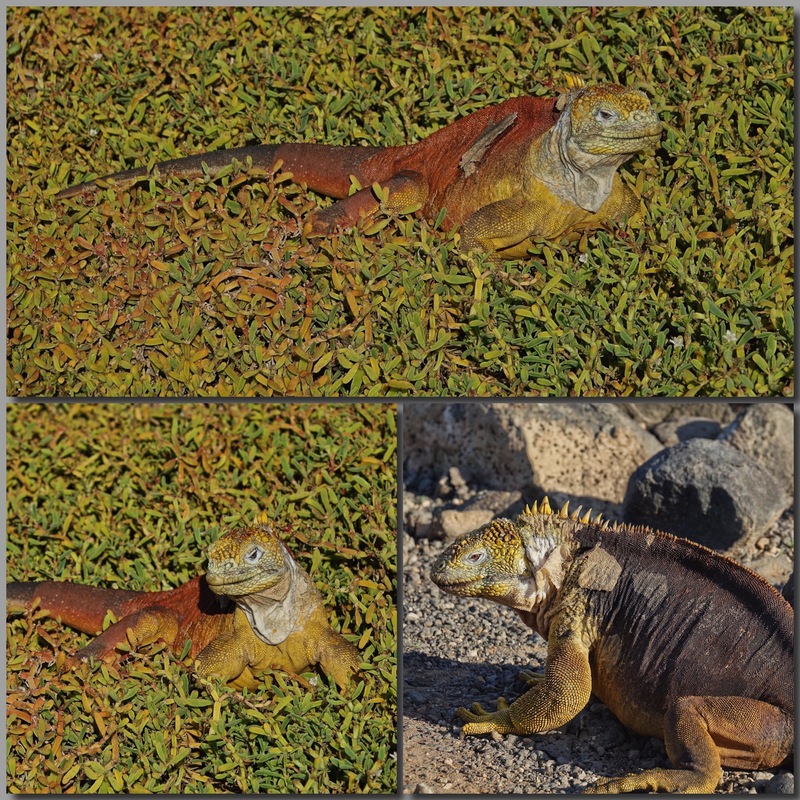 Giant Prickly Pear trees, and Land Iguanas. Galapagos Racer Snake. 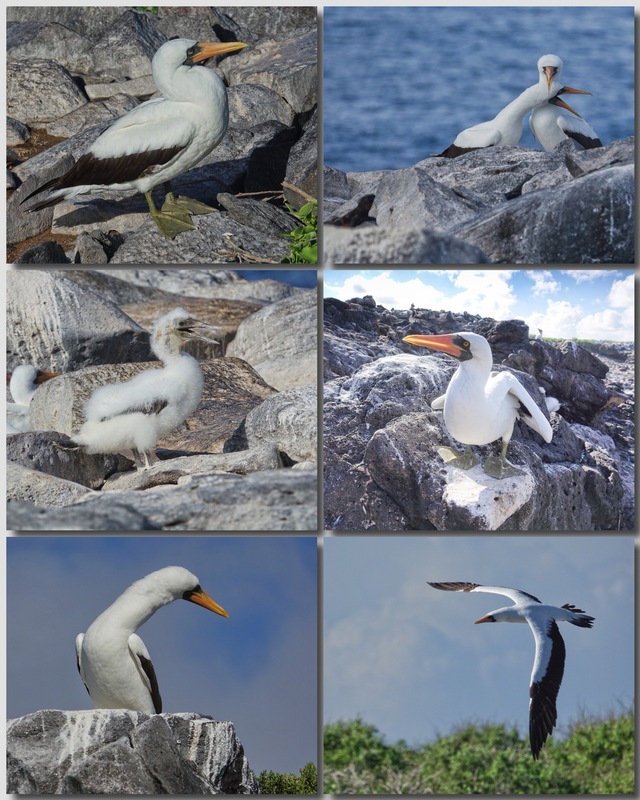 The afternoon was spent on Santa Fe Island, with more Land Iguanas, chances to photograph Tropic Birds from the cliffs, wonderful views of Swallow-tail Gulls, and a close encounter with a Lava Heron…as well as stunning landscapes. 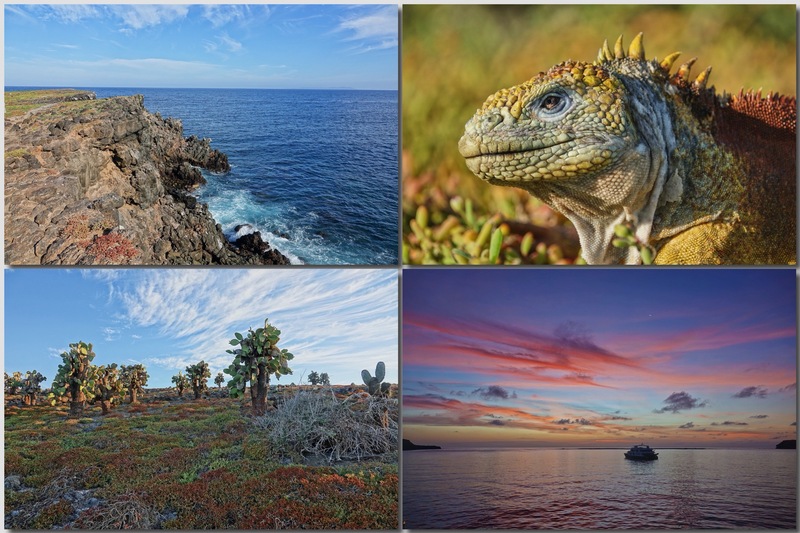 Santa Fe Island, Land Iguana, Prickly Pears, sunset! North Seymour Island was our next to last stop…saving the best for last. 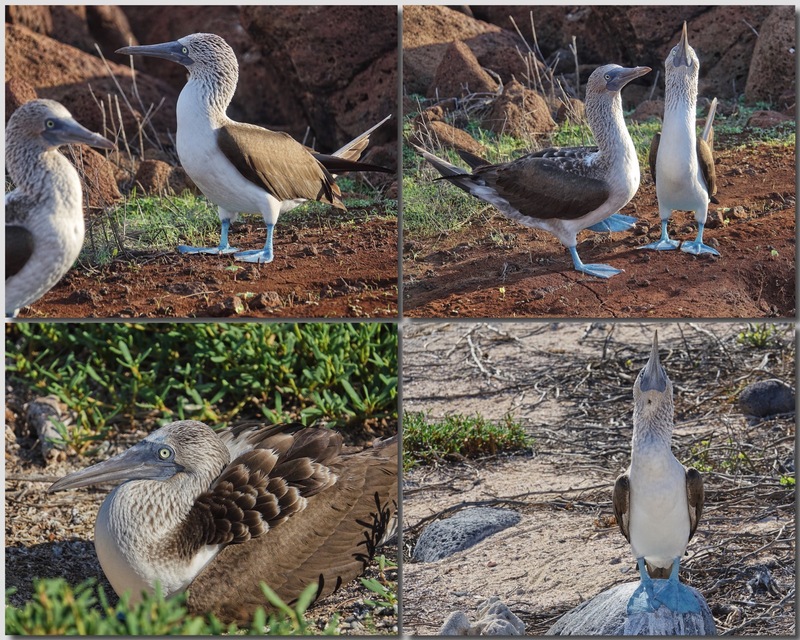 North Seymour has nesting colonies of Blue-footed Boobies and a mixed colony of both Magnificent and Great Frigatebirds. The Boobies are everywhere, underfoot, nesting in the trail, beside the trail…so close you sometimes have to walk around them. 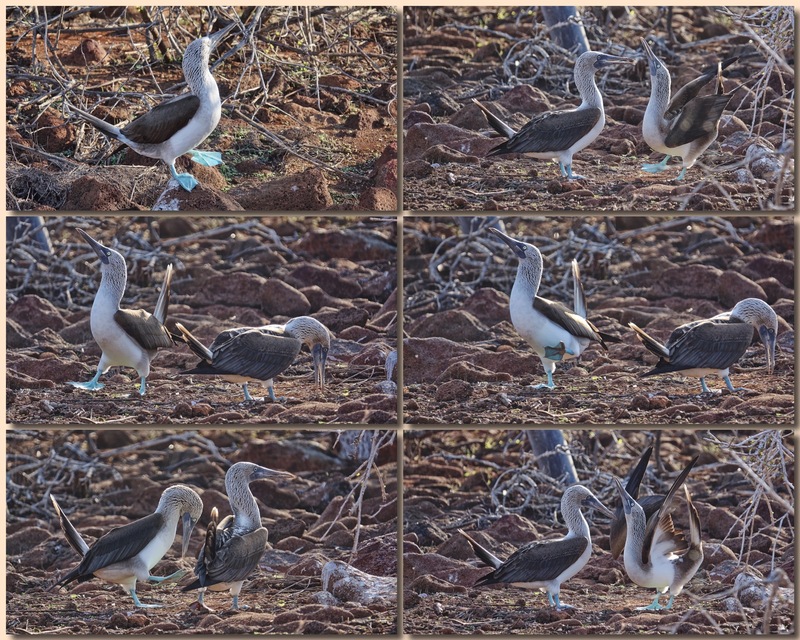 And they are displaying…doing their booby dance in pairs. 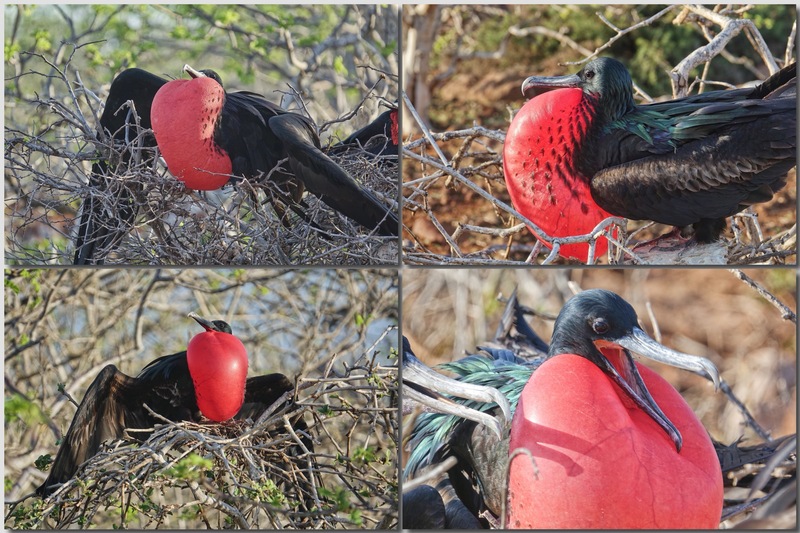 The Frigatebirds are almost as close, nesting in taller brush wherever they can find space…and the males are in full display (or were when we visited). It is a totally amazing experience. 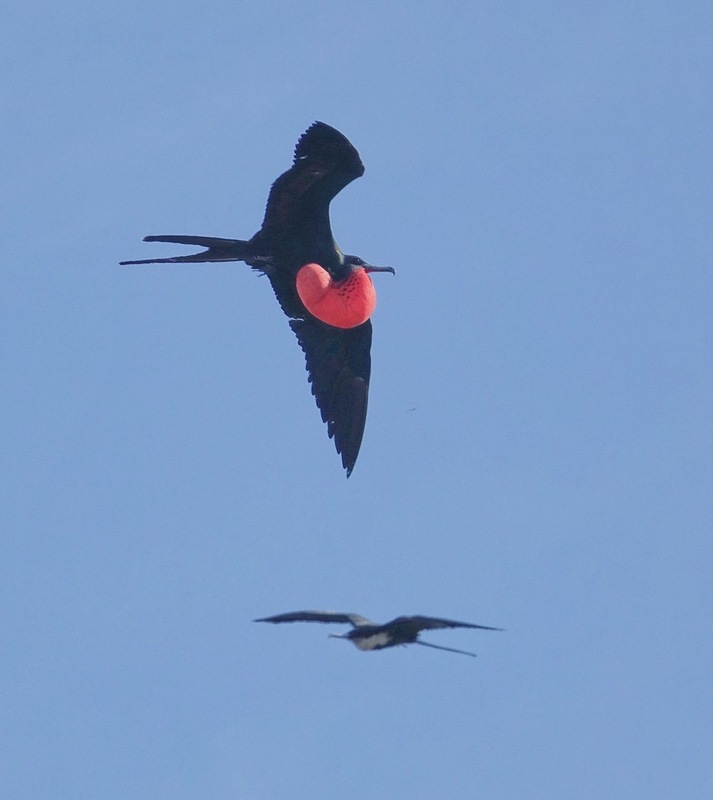 Nesting Great or Magnificent Frigatebirds. The Great have more green sheen on the neck but they are hard to tell apart. 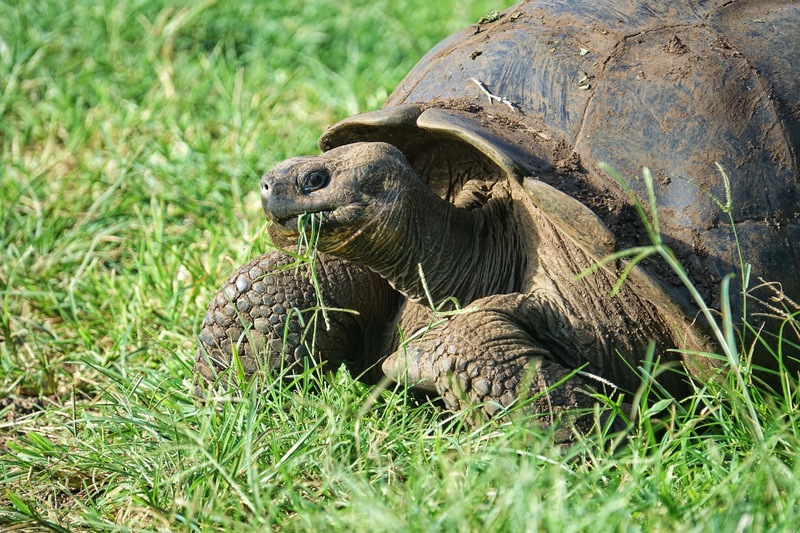 On our last full day in the islands we visited Santa Cruz, and traveled by bus up into the highlands to visit the largest of the Giant Land Tortoises that inhabit the Galapagos. 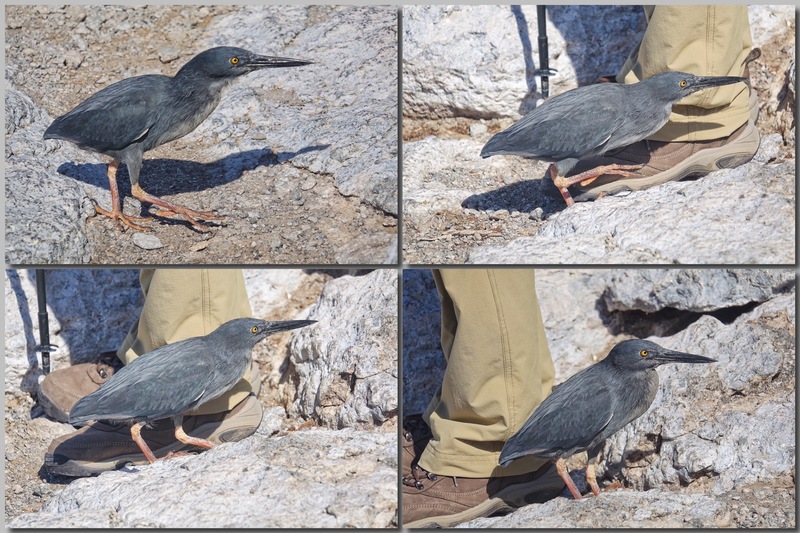 We stopped along the way for some birding and sightseeing around a huge sink-hole, a common feature of volcanic islands. It is hard to imagine just how big the Giant Land Tortoise is. 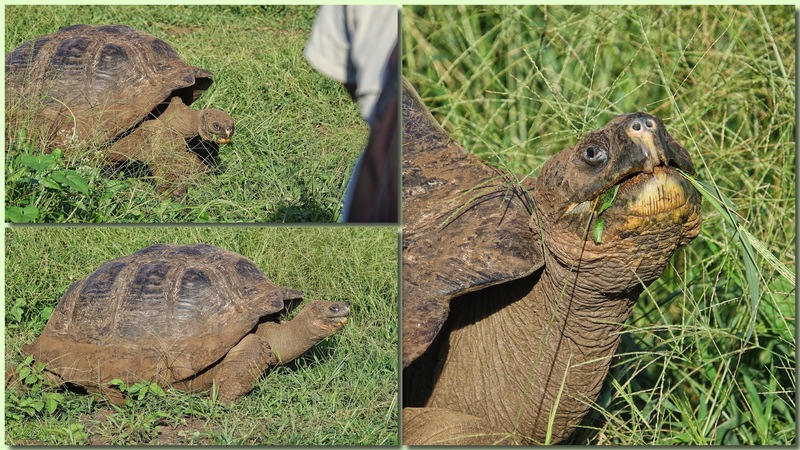 When they move through the brush they are like a bulldozer…nothing stops them…and yet this giant grass eater is among the gentlest creatures on earth. Too gentle perhaps as hundreds of thousands of them were collected each year, before they were protected, by passing ships and consigned to life in the hold until the crew was hungry for fresh meat. Since protection their numbers are slowly growing on the islands and most of the high islands have reserves. 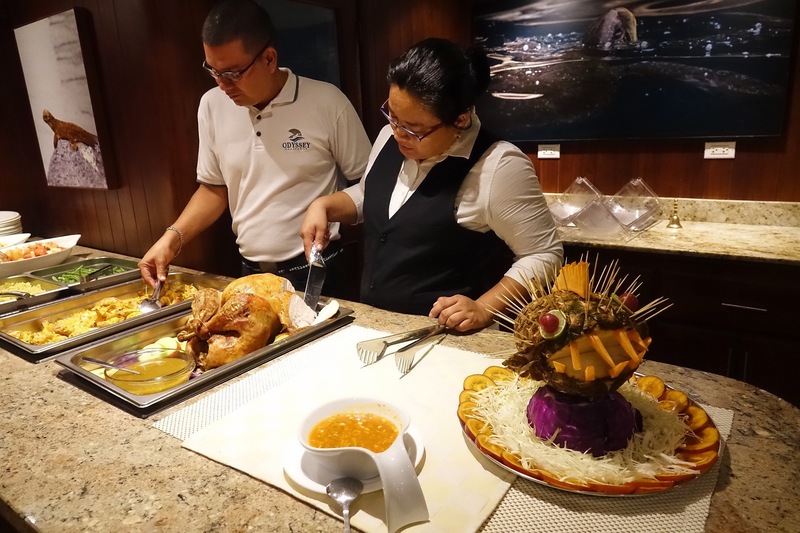 The meal on our last night on the yacht was a thanksgiving spread, complete will all the fixing, and a edible puffer fish sculpture. 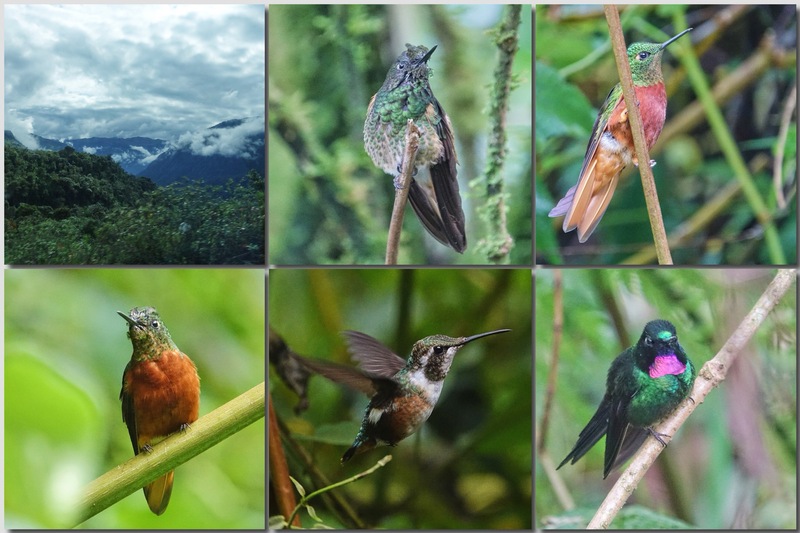 We flew back to Quito for another night at the Garden Hotel, but since most of us had night flights out, we spent our last day in Ecuador traveling to the high Andes above the city and over the other side for Andean hummingbirds. We visited a lodge that specializes in hummers and spent a slightly rainy day photographing them, and sharing a traditional Ecuadorian meal. The Sony RX10iii really came through on the hummingbirds in low light. We were back in Quito in time for evening flights. 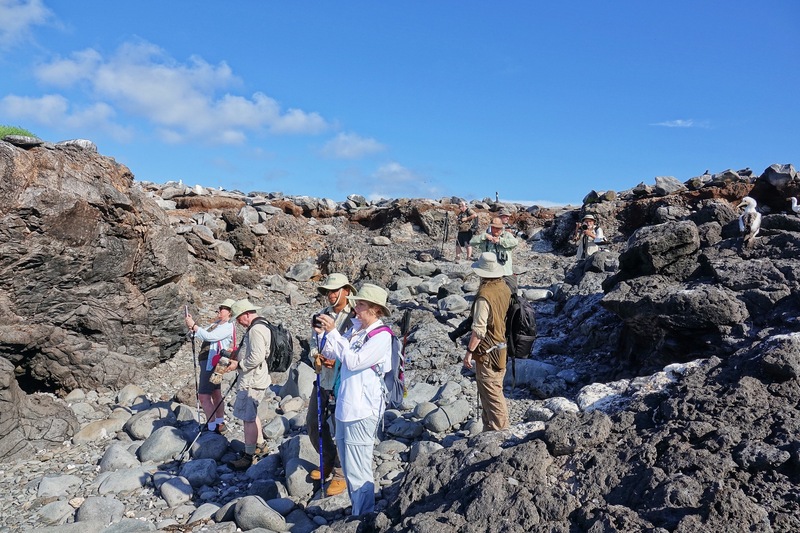 The end of a remarkable adventure in the Galápagos…thanks to Wildside Nature Tours. In August of 2016 I had the privilege of being the official ZEISS host for a ZEISS/Eagle Optics trip to Tranquilo Bay Lodge in Bocas del Toro, Panama. While it was a birding trip, not a photography trip (and there is a difference), I took along my Sony RX10iii (and two back-up cameras) for those inevitable (at least for me) photo opportunities. I have said here before that in my opinion, Tranquilo Bay Lodge and the surrounding area in the islands of Bocas del Toro, and the lowlands, foothills, and mountains of the ajoining mainland, are one of the best spots in Central American for bird and wildlife photography, especially during migration season. Our August trip proved that it is also excellent even at slower times of the year. I am posting several slide shows of images. All were taken with the Sony RX10iii in Program Mode, In-camera HDR, or my customized Birds-in-flight mode (based on the built in Sports Mode, see here) and processed in Lightroom. This firsts set is from Day One. 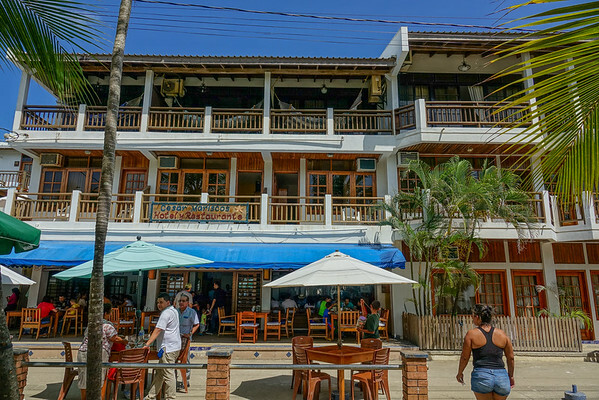 You have to overnight in Panama City to get to Bocas del Toro at any reasonable time on your first day. 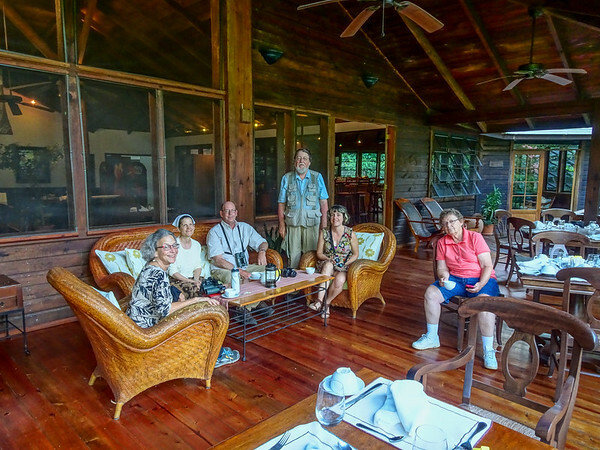 The Lodge books the dawn flight from the domestic airport in Panama City, so you are in Bocas early enough for a full day of exploring or birding. 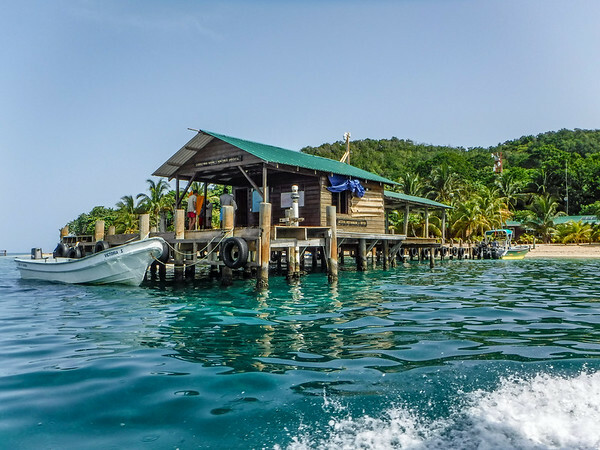 The Lodge picks you up at the airport and transports you to their boats at a dock in Bocas Town, and you motor out to Bastimento Island were Tranquilo Bay Lodge is located. We were met, half way up the boardwalk between the dock and the foot of the stairs leading up to the Lodge by what appeared to be the official Tranquilo Bay greeter for the day…a Three-toed Sloth in the canopy above us. That set the tone for the whole trip. After check in and island breakfast with your hosts at the Lodge, you head out to explore the trails around the island before lunch. After a siesta, which gives you a chance to unpack and even shower, you are off again on new trails, ending your exploration on the Canopy Tower on the hill above the cabins, watching flights of parrots returning to their roosts for the night. On day two, we were up early to travel to the mainland for a day in the lowlands, foothills, and mountains. You can drive from the dock, right up to and over the continental divide, on good paved roads. The first section is lowland grass and swamp, then the foothills with rainforest, and eventually the mountains right up to the edge of cloudforest. 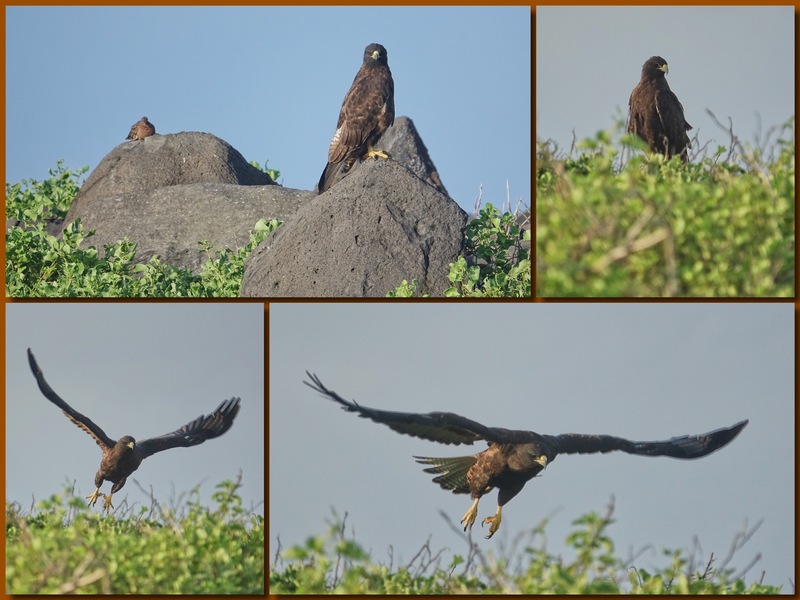 Spectacular birding and photography all the way. We got rained out on our first approach to the divide, and went back down to the Ranger Station where we had lunch under their thatched shelter. By the end of lunch it has stopped raining and we went back to the divide to bird, then retuned to the foothills to end the day. There were many interesting dragonflies along the road were we birded on the way back. Day three took us the Green Acres Chocolate Farm for morning birding, adn then back to Tranquilo Bay for the afternoon. The Chocolate Farm is near the mainland and has different species than Bastimento…including a totally different species of Poison Dart Frog. On day four we traveled to the mainland again to explore the lowlands and ridges of the Changuinola region on the north edge of Bocas del Toro. Besides interesting birds, we encountered a number of butterflies, most of which I can not identify yet. 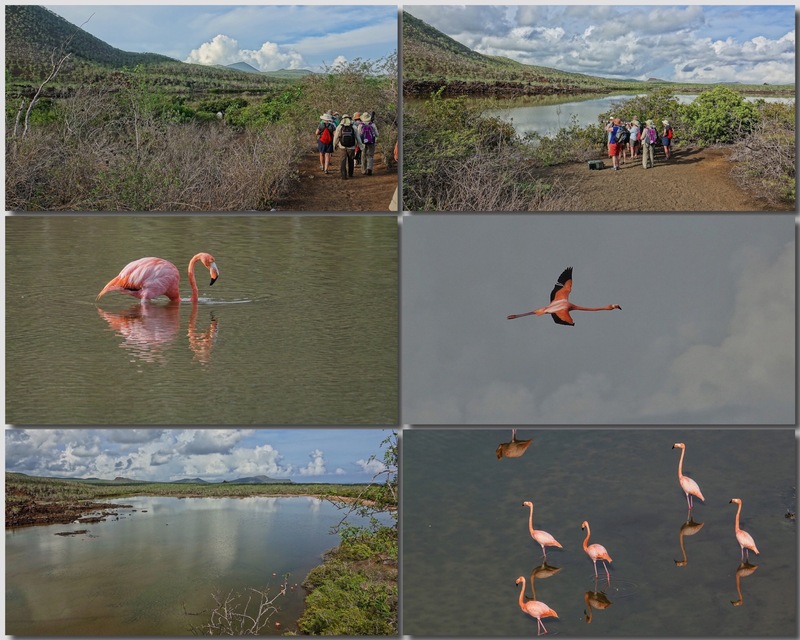 Day five was our day to visit Isle de Popo, a close neighbor of Bastimento and Tranquilo Bay. There are two major attractions at Popo. One is a population of Snowy Contingas, and the other is the unique phenomenon of a mix of color variations of Poison Dart Frog in a single location. Generally Poison Dart Frog variations are restricted to small ranges on individual islands or individual drainages. On Popo, in an area the size of a heavily forested football field you can find at least 5 different color variations of Poison Dart Frogs, plus two separate species. 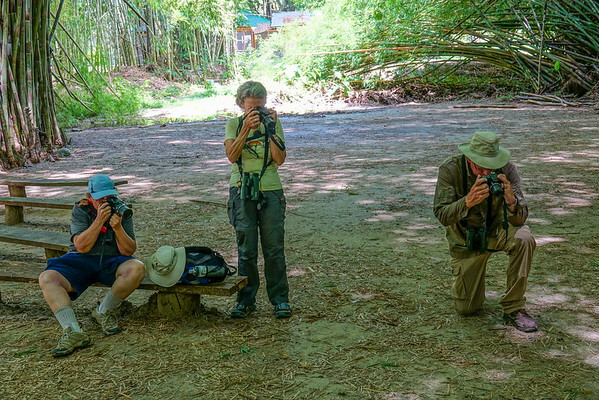 Though I was with some hard-core birders, I persuaded them to visit the frog spot, and most seemed to really enjoy chasing the elusive critters around the forest floor, trying to find new color variations. We had just about given up on finding the rarer second species and were actually headed back before Ramone, our guide, found one. One of the birders jokingly asked for a Tourquoise frog. We found her one of those too. We did not, however, find the Snowy Cotinga, though we came back to Popo after our afternoon rest period, and again on our last morning at Tranquilo Bay. Not for want of trying. Between trips to Popo on Day five, we had some free time. 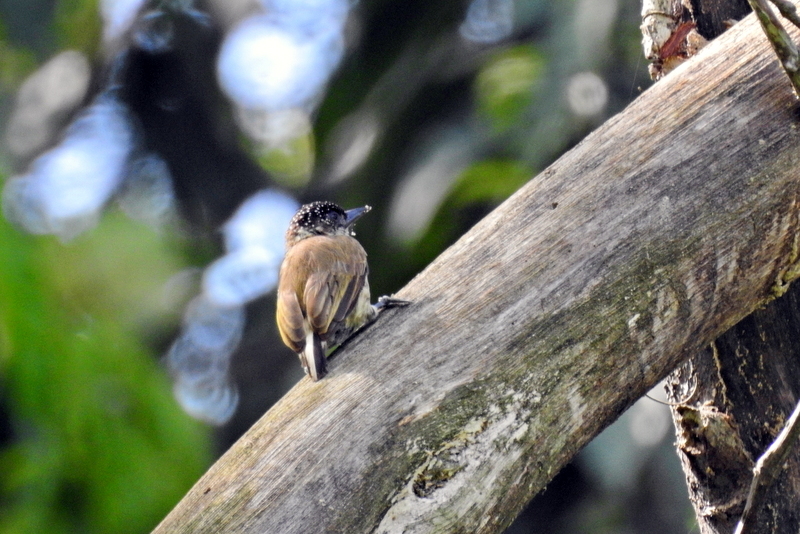 Some went on another hike around the lodge in search of the Three-wattled Bell Bird. I elected to hike back to the Golden-collared Manakin lecks to see if I could photograph these elusive but brilliant birds. Tranquilo Bay Lodge has to be one of the best places for Golden-collared Manakin. After a long hot wait in the humidity and mosquitoes, I was rewarded with two male Manakins coming into the lecks. August is late for any lecking activity so I felt particularly privileged. They did not actually get down and display, probably because there were no females in the area, but I got some keepers of the males. Day 6 was our day for the Snyder Canal and Swan Island. 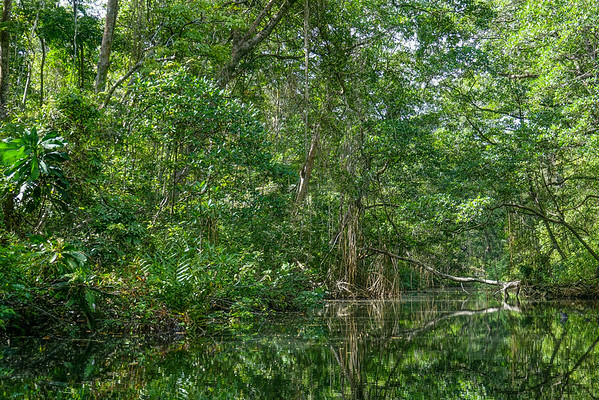 The Snyder Canal was built at the turn of the century by the United Fruit Company to transport bananas from the plantations to the ships in a deep channel in northern Bocas del Toro, near the mouth of the Changuinola River. It was only in active service for about five years before the railway put it out of business, but it is still there, winding its way parallel to the coast through some prime swamp and lowlands. 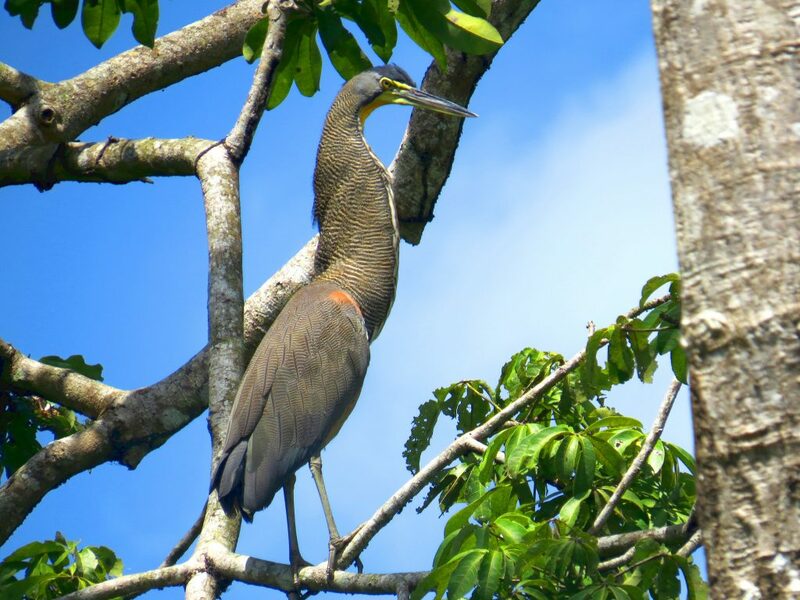 It provides easy access to some of the best birding in Bocas del Toro. Swan Island is a volcanic plug about 40 minutes off-shore out in the Caribbean. 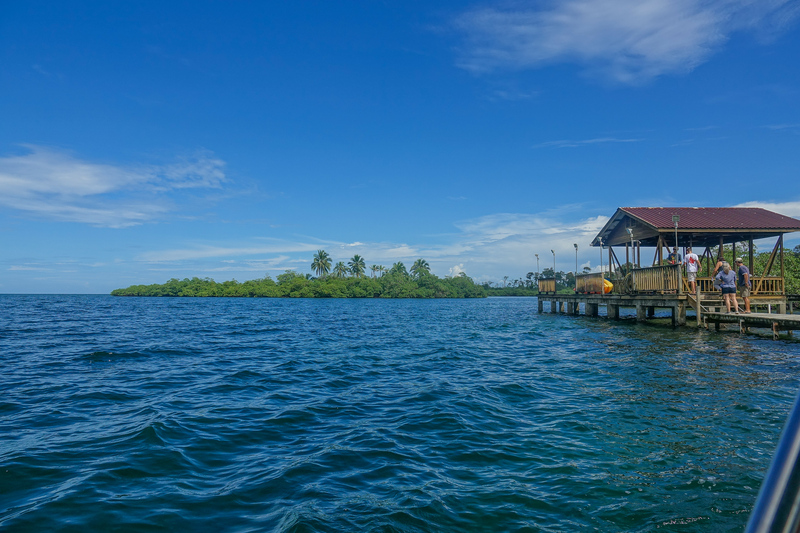 It is home to a nesting colonies of Red-billed Tropicbirds, Brown Boobies, and Frigatebirds…and is one of unique attractions of Tranquilo Bay and Bocas del Toro. After finishing in the Snyder Canal and Chinguinola River, we headed to Swan Island. All images here are taken in my custom birds-in-flight mode. On our last day, the day we traveled back to Panama City to spend another night before our flights home, we made, as I mentioned, one last try for the Snowy Cotinga, without success. 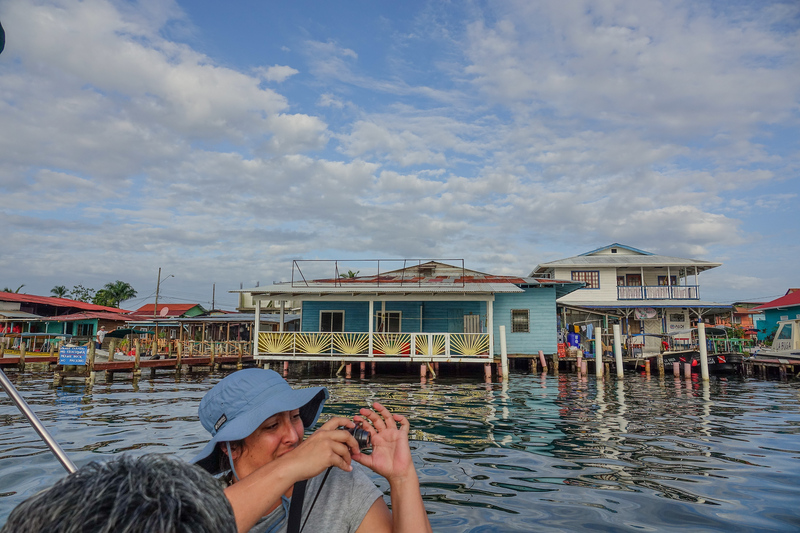 Just before we left for Panama City, I took some time to shoot fish off the dock, and then we were back in the boats and on our way to Bocas Town and the airport. Well it actually happened! 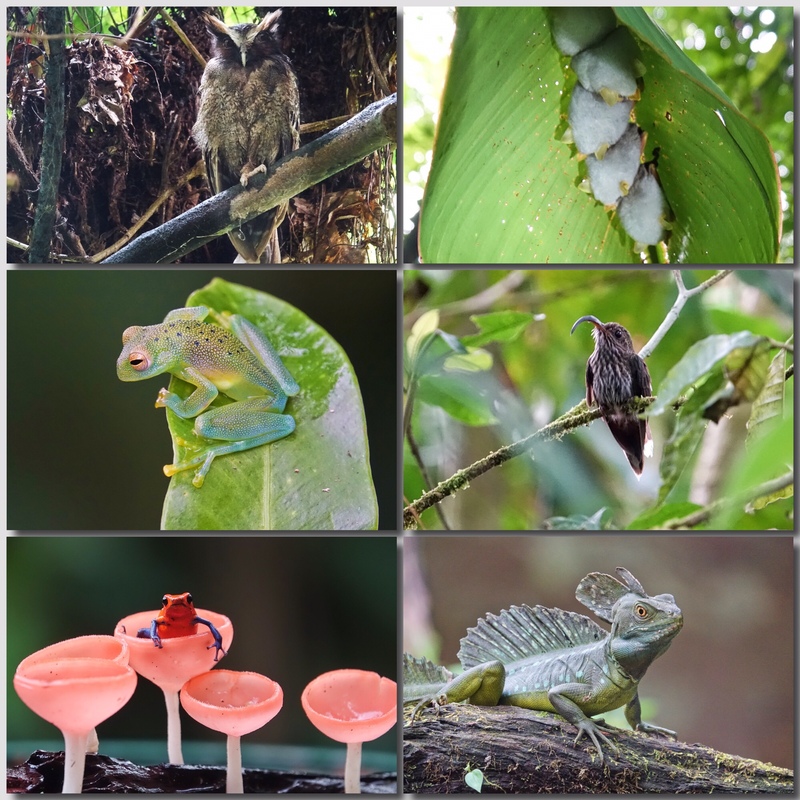 The first Point and Shoot Nature Photography adventure in the tropics…at the Lodge at Pico Bonito, Honduras, was, imho, a solid success. My wife, Carol, came along, as well as my oldest daughter Sally (as my assistant), and we had three participating adventurers: Ev, Barbara, and Greg. It was a Point and Shoot trip, and between us we had a Nikon P610, a Nikon P900, a Canon SX60HS, and a Canon SX50HS. I brought both the Nikon P900 and my new(er) Sony RX10iii, but I shot most of the time with the Sony. The goal was to provide as many photo ops as possible over 5 full days. The Lodge at Pico Bonito is somewhat unique in providing first class accommodations and gourmet food, excellent guides, and a totally new adventure each day. Greg’s image of the Crowned Wood Nympth at the Lodge at Pico Bonito, right off the porch. Canon SX50HS. 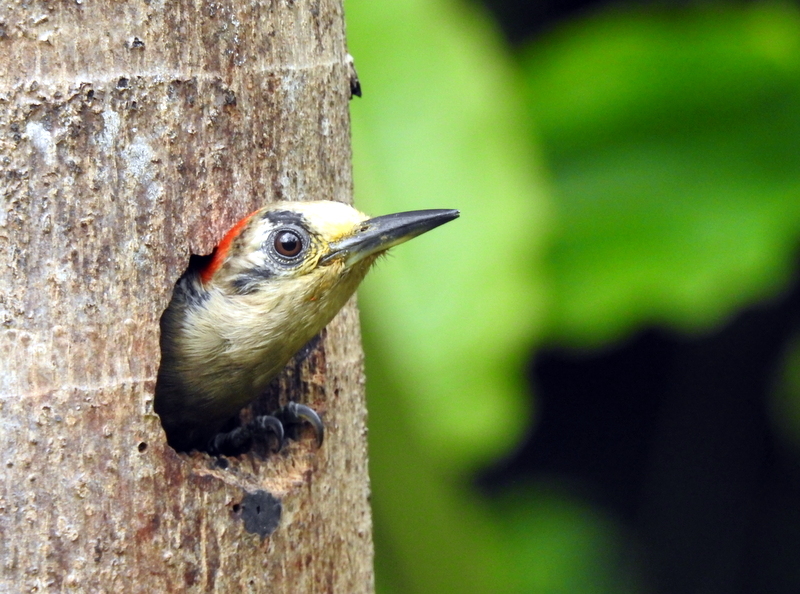 Black-cheeked Wood Pecker chick, The Lodge at Pico Bonito. Ev’s image with the Nikon P900. 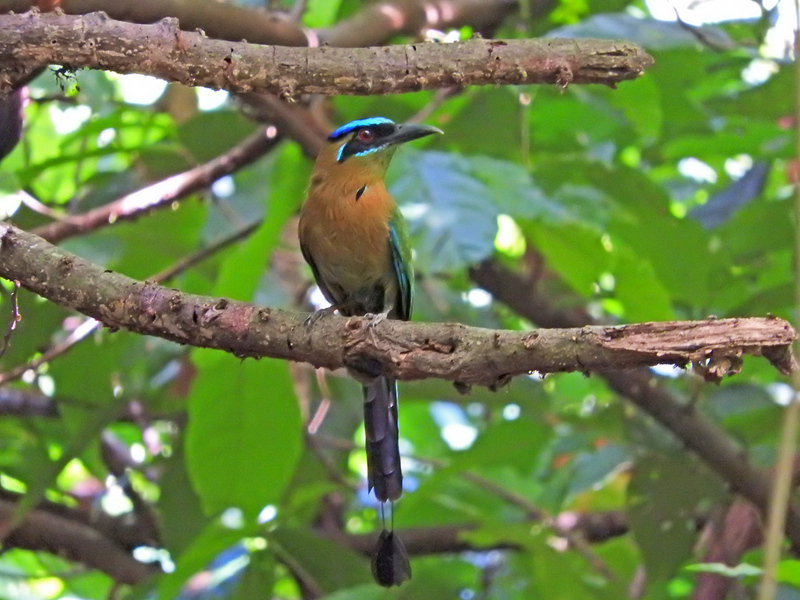 Blue-crowned Motmot. The Lodge at Pico Binito. Sally. Nikon P610. 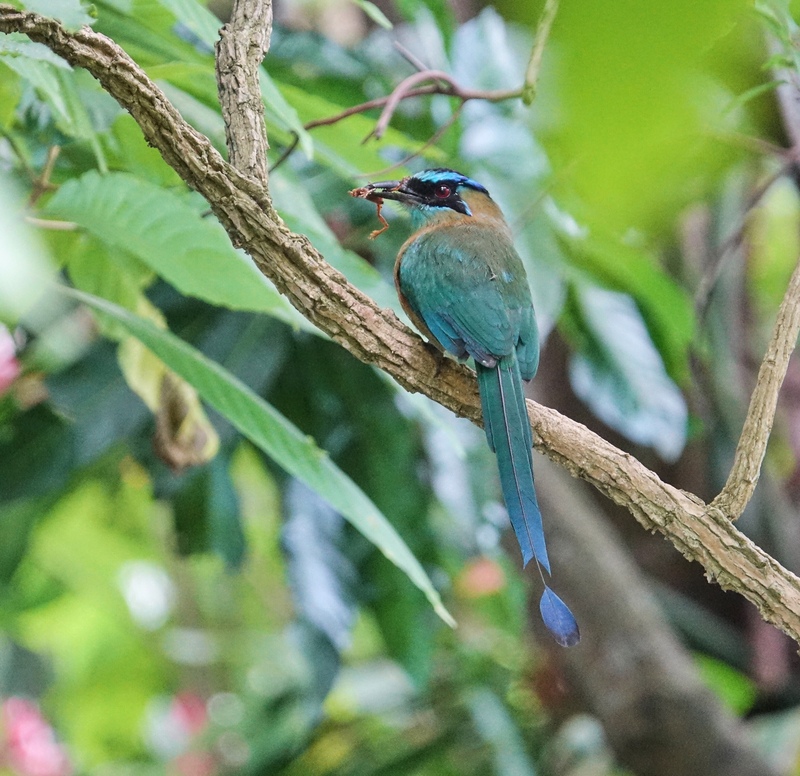 Blue-crowned Motmot, the Lodge at Pico Bonito. Barbara with the Canon SX60HS. Elmer (Elmer Escoto our expert guide) lead us off the trail to find a mother Great Pooto with a well grown chick sitting out in plain view. Perhaps the highlight of our day on the grounds was when Elmer tempted a Little Tinamou out into the open where we could all see it, and at least a few of us got shots. 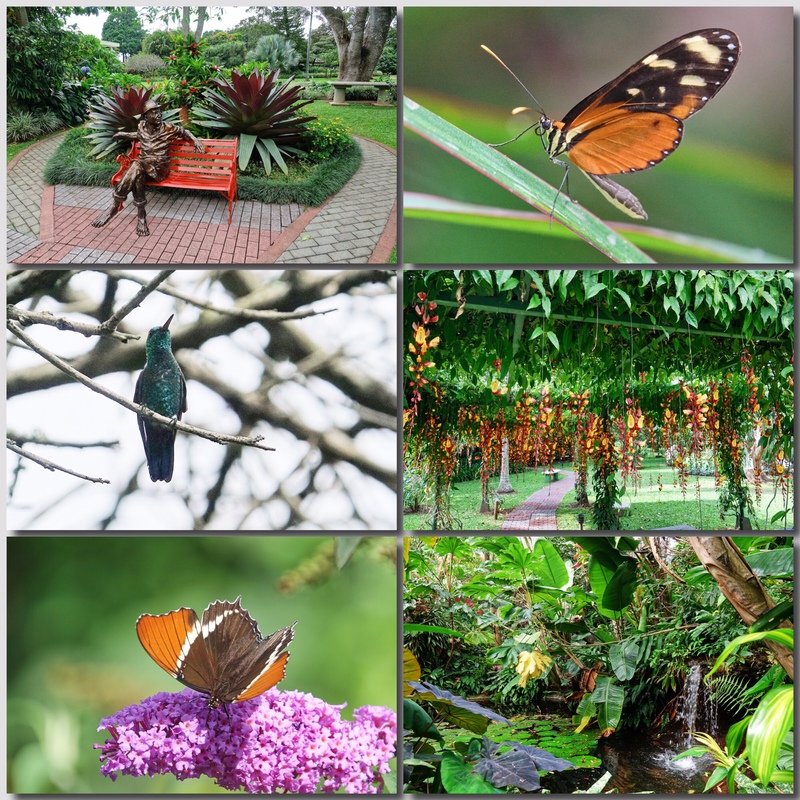 The Lodge maintains a butterfly garden and butterfly house, and between them we saw a dozen species of tropical butterflies: including the amazing Red Cracker (a blue butterfly despite its name…with a wing pattern that reminds me of a dutch dinner plate). 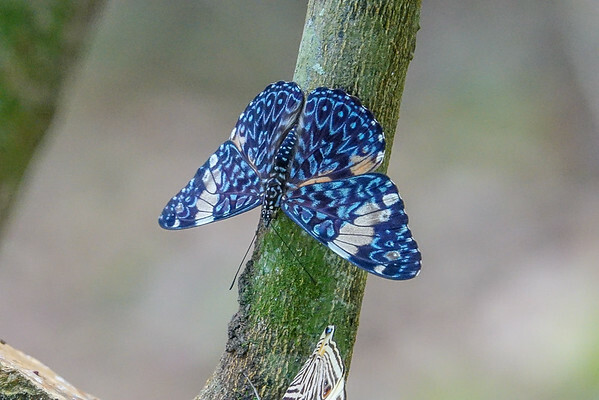 There were at least 5 different Heliconians (Long-wings), and, in the butterfly house, several of the giant Blue Morphos that are pretty much the butterfly emblem of the tropics. Amazon Kingfisher, Rio Cangrejal, Honduras. Ev with the Nikon P900 at full reach. 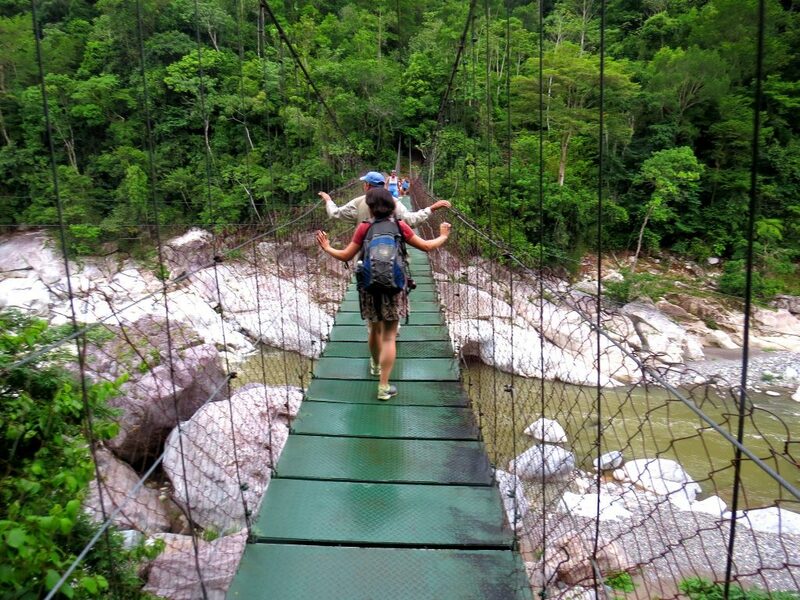 suspension foot bridge high over rushing water and house-sized boulders, was spectacular. 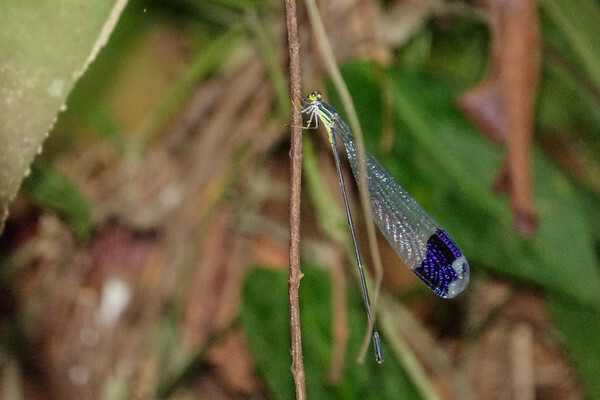 Along the way we had great views of Amazon Kingfisher…though at the limits for photography, and on the other side of the river we encountered the Helicopter Damselfly…the largest damselfly in the world, with a wingspan larger than even the largest dragonfly. We tracked it into the deep shade of the rainforest where we were able to get some decent flash shots. 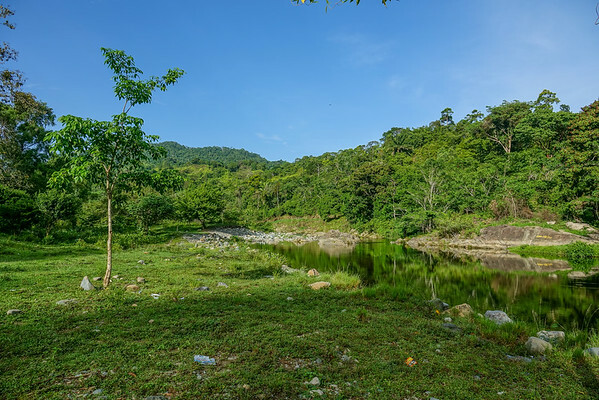 We got to see some unscheduled landscape, and a part of Pico Bonito National Park that most who go to the Lodge for birding and photography do not see. The Banana train to Cuero y Salado Wildlife Refuge, Ev with the Nikon P900. The next morning was our first real day in the field. 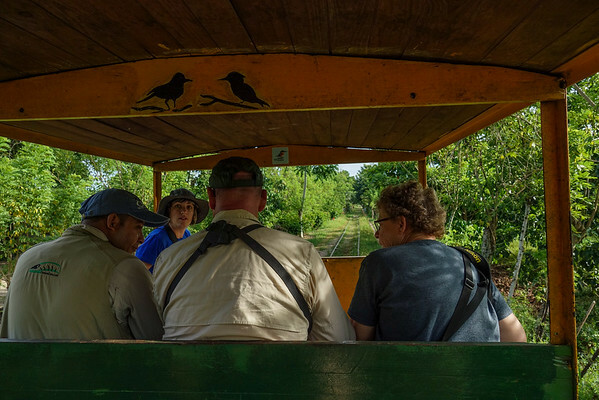 We visited the mangrove channels of the Cuero y Salado estuary, riding a century old banana train into the refuge at the mouth of the rivers, and then taking a small motor boat up the channels into the mangroves as far as we could go. 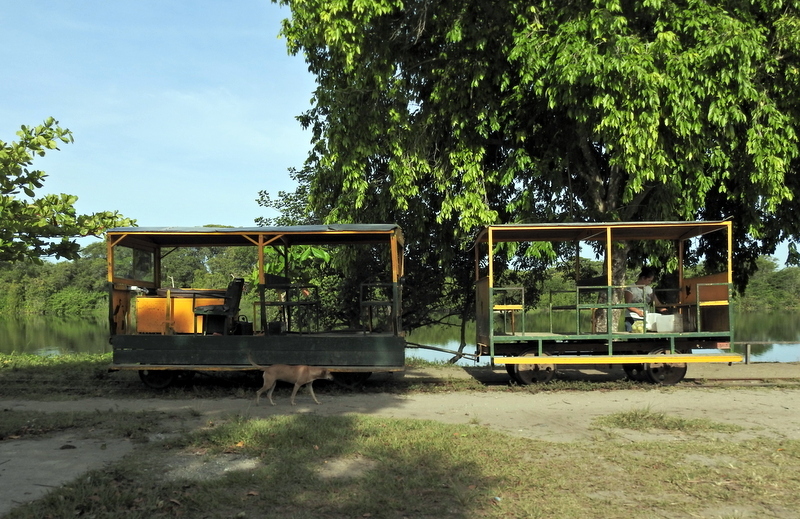 on the Banana train on the way to Cuero y Salado. Steve, Sony RX10iii. Elmer, Sally, Greg and Ev. 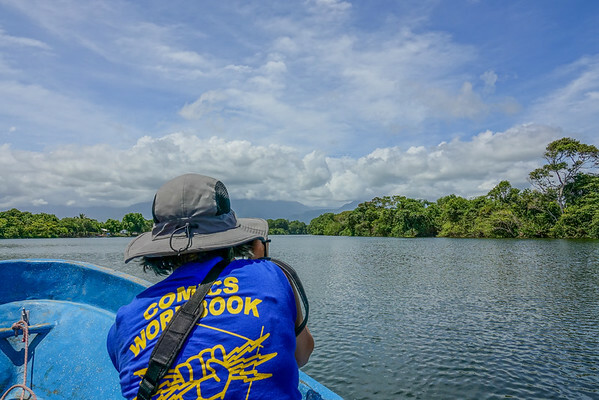 My hopes for the boat adventure are always Pygmy Kingfisher (since I really like Kingfishers), Bare-throated Tiger-heron, Boat-billed Heron, and monkeys…both Howler and White-faced Capuchin. 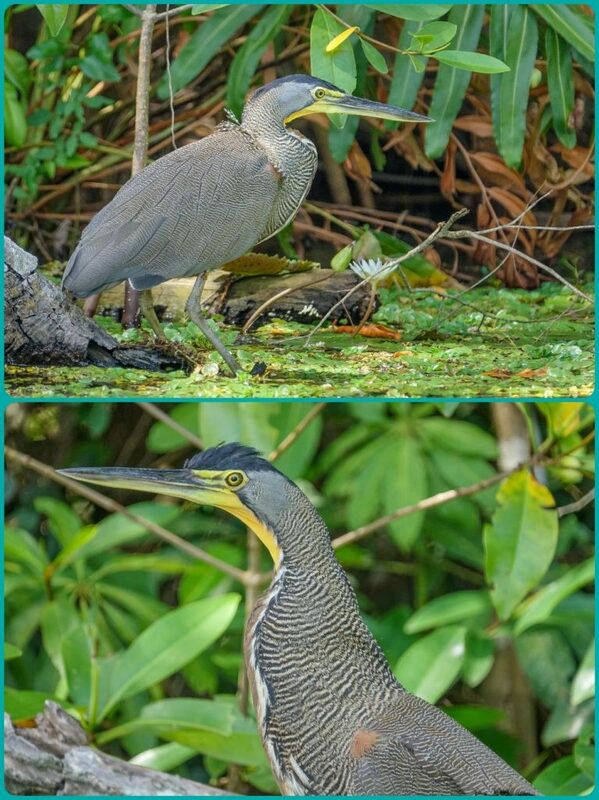 There is always a remote hope for Agami Heron and Sungrebe. 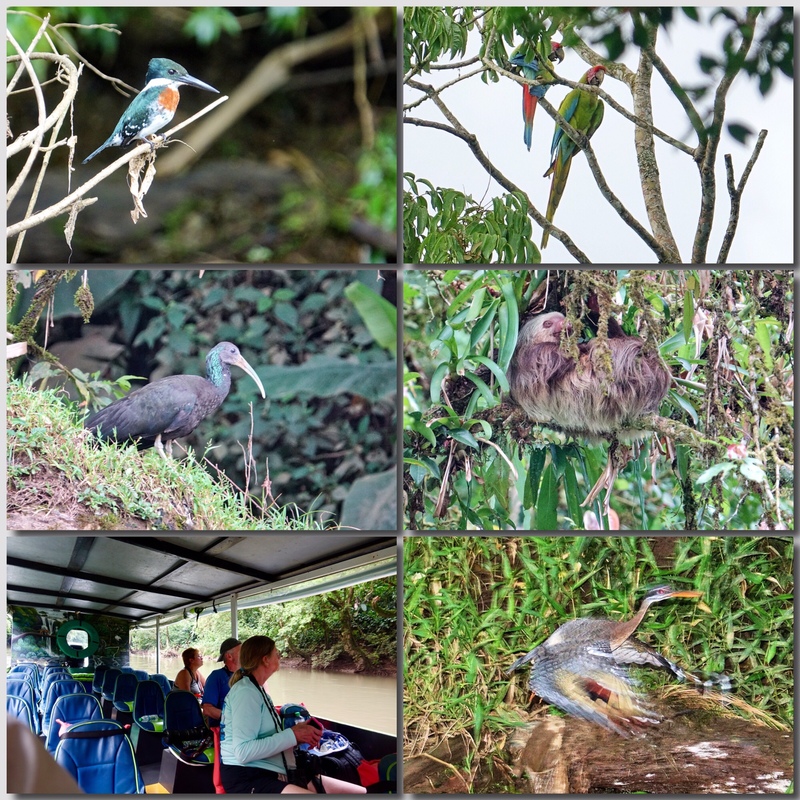 On our day on the rivers, we had good looks at all but the last two, plus Long-nosed Bats, many Northern Jacana, Black-bellied Whistling Ducks, Black-headed Trogon, and more Green Herons than I could count. And I mean really good looks at everything but the Boat-billed Heron, which flew off before everyone could get pics, and the monkeys, which played hard to get in the dense foliage. 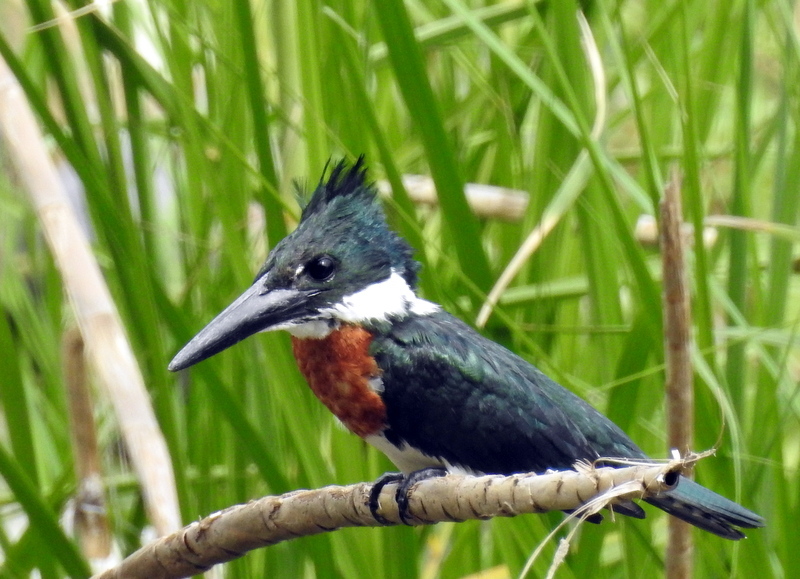 This is a gallery of images from the group of the same very cooperative Pygmy Kingfisher. We had some trouble finding it in the first place and had actually given up and were headed back out of the channel where it is known to nest, when Elmer’s sharp eye caught it. We were able to drift close in with the boat, but these are still shots are taken from a moving boat of a very small bird. Great results for everyone. Deep in the mangroves on a channel off the Cuero. We had a similar opportunity with the Bare-throated Tiger-heron. Sally spotted it as we motored down the open river toward another channel (earning her supper that day), and we were able to drift in within a dozen feet of it before it flew up to perch practically right over our heads. As I mentioned, the monkeys were elusive, and especially hard to photograph from a moving boat. 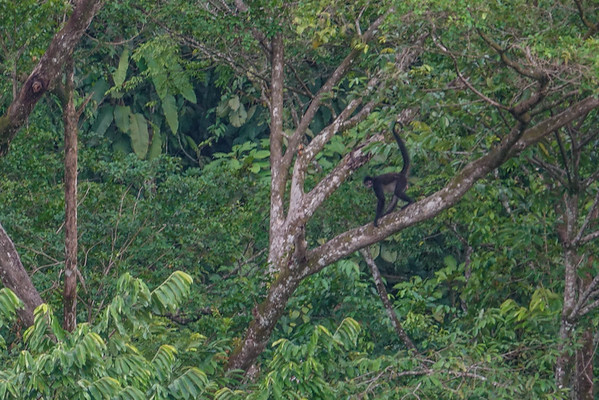 I managed a quick shot of the Howler we spotted, and even more distant shots of the White-faced Capuchins. The Capuchins came just close enough to keep an eye on what we were doing…but not really close enough for photography. Looking up the river back towards Pico Bonito. Sally rocking her Comics Workbook tee shirt and framing the view. Clash of cultures. 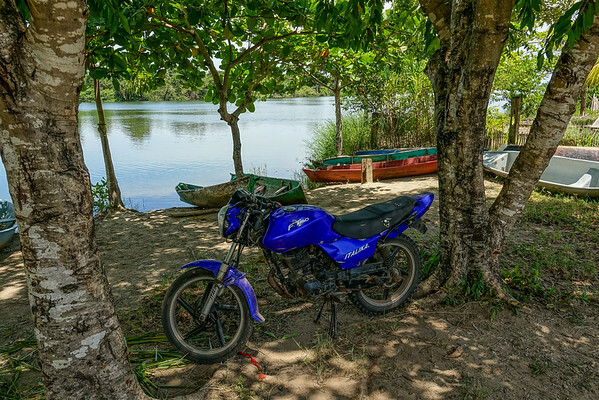 Motorbike and hand crafted dough-out canoes. Once back at the boat dock near the Visitor Center for Cuero y Salado, we enjoyed some chilled fruit and cookies, courtesy of the Lodge, and then hiked about 300 yards out to the beach at the mouth of the rivers. 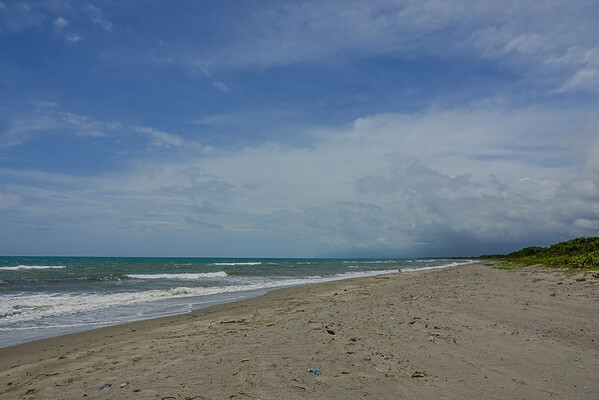 It was typical June Honduran day on the Caribbean coast…sunny with towering clouds over the mountains and a storm coming in off the sea. Looking east from the mouth of the Cuero y Salado rivers. The group on the beach at Cuero y Salado. Ev, Sally, Carol, Barbara, Elmer, and Greg. When we got back to the lodge, after lunch on the veranda, some went exploring around the grounds, while others rested until we met again at 3 pm to go to the first Tower in search of the signature bird of the Lodge at Pico Bonito…the Lovely Cotinga (and whatever else we could find). The Cotingas put in an appearance, though beyond the range of practical photography, but we had good views of a White Hawk out across the valley, some Keel-billed Toucans feeding on fruit, and our third primate of the day: Spider Monkeys (way over on the far side of the valley). On our night hike, we went in search of Vermiculated Screech Owl in the Coco plantation. Though we were within a few feet of and heard it calling right above us, we never could find it in the dense overstory foliage. 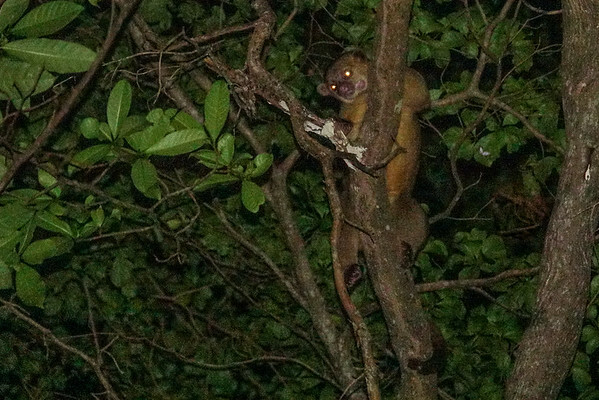 As compensation Elmer found us a Kinkajou within flash range, and the Great Pooto (which was hand-raised at the Lodge a few years ago before release) put in an appearance on its favorite corner of the first tower. 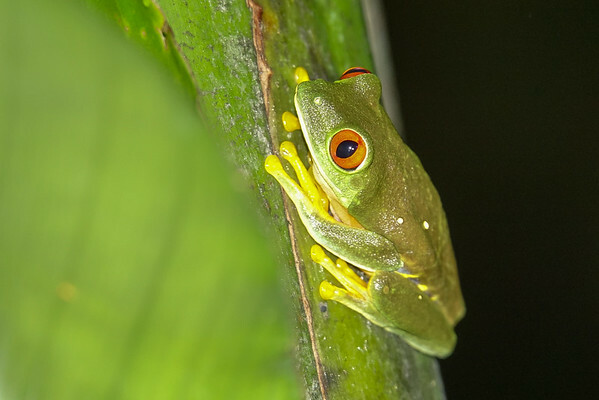 The Red-eyed Tree Frogs were calling around the Frog Ponds beyond the tower, and Elmer found us two to photograph. Along the way we picked up both Rainforest and Marine Toads (Marine Toads have to be seen to be believed…they are huge!) and various Anoles and bugs. It was such a rewarding hike that a few of us headed out for an encore the next night. Along the road on the way up we got out and walked, exploring the fields on either side. We found Boat-billed Kingbirds, Blue-black Grassquits, Rose-breasted Bicards, Passerini’s and Blue-grey Tanager, Scrub Euphonia, Starry Cracker Butterfly, and a nesting Green-breasted Mango Hummingbird. 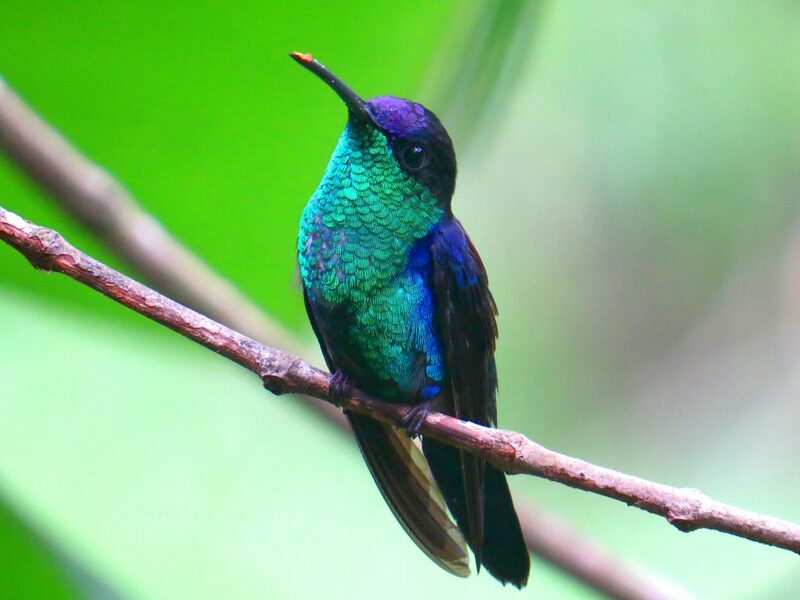 Rio Santiago Nature Resort maintains about 200 hand-crafted tube hummingbird feeders year round, which, along with the richly landscaped grounds, regularly attract over a dozen species of hummingbirds. And the hummers are close. You can sit on either of two covered verandas and have hummingbirds literally buzzing around your head. You can stand on the lawn and watch constant activity as the various species compete for space at the feeders less than 8 feet away. It is an experience not to be missed. On the day we visited the Brown Violet-ear Hummingbirds were dominating the feeders in such numbers that it kept many of the regular visitors away, but it was still a great experience. White-necked Jacobin, Steve. Sony RX10iii Sports Mode. Hummingbirds are not the only attraction at Rio Santiago. 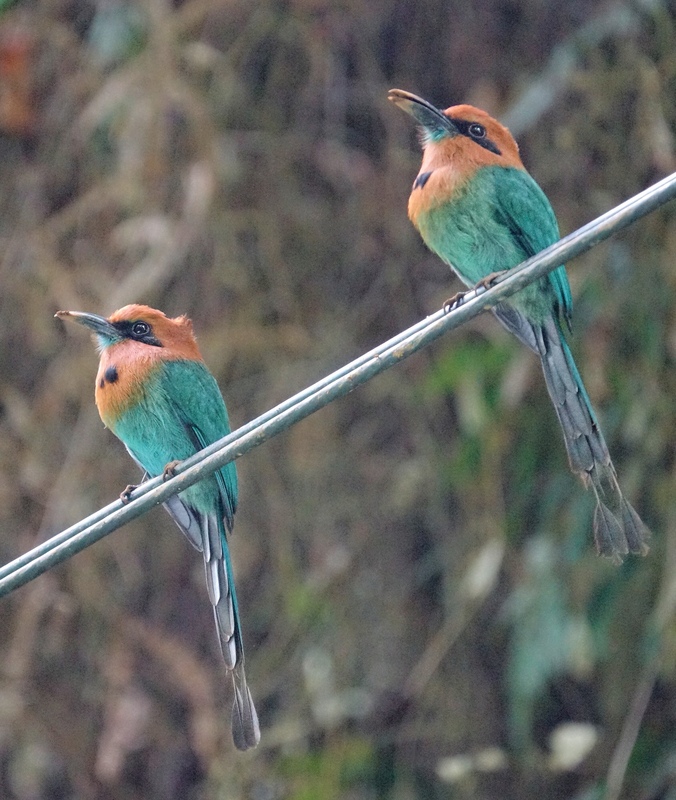 It is also one of the most reliable places to see the Keel-billed Motmot. Gartered Trogons are regular there. They have snakes and lizards, dragonflies along the streams, interesting butterflies, a resident pair of Specticaled Owls, and, this year, an abandoned Margey kitten that they are attempting to raise for release. 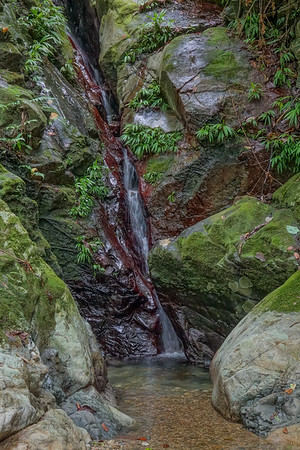 And if you enjoy scenery they have one of the most attractive small waterfalls in the foothills of Pico Bonito National Park, right there on the grounds. Elmer worked hard to find us a Keel-billed Motmot, and it was there, calling above the waterfall, but it stayed high in the canopy. We got the shots we could under very difficult conditions. The Specticaled Owls were also playing hard to get during our visit, but several of us managed decent shots. 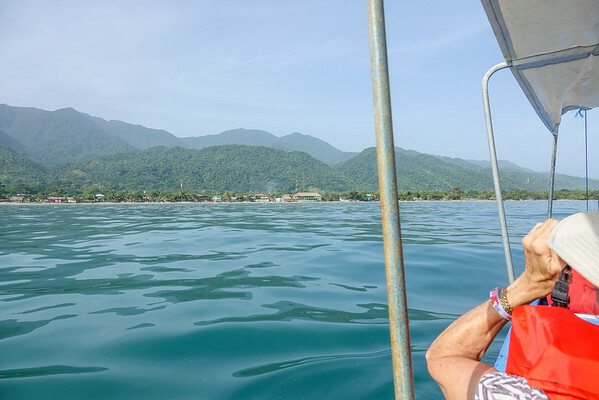 Looking back from the boat toward Sambo Creek and the coastal mountains of Honduras. One of the sand cays of Cayo Cochino over the shoulder of our boatman. turquoise: The Caribbean at its best. 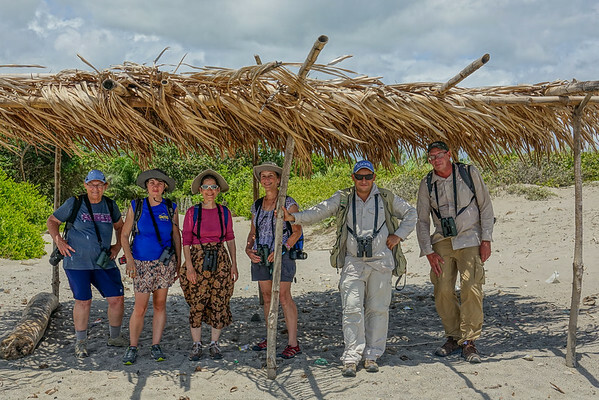 Parts of Cayo Cochino are protected habitat, and our first stop was the Visitor Center on Cayo Cochino Minor, operated by the Smithsonian Institute. Around the Visitor Center we found Yucatan Vireos, Allison’s Anole, and lots of Spiny-tailed Iguanas (the native Iguana of Honduras). 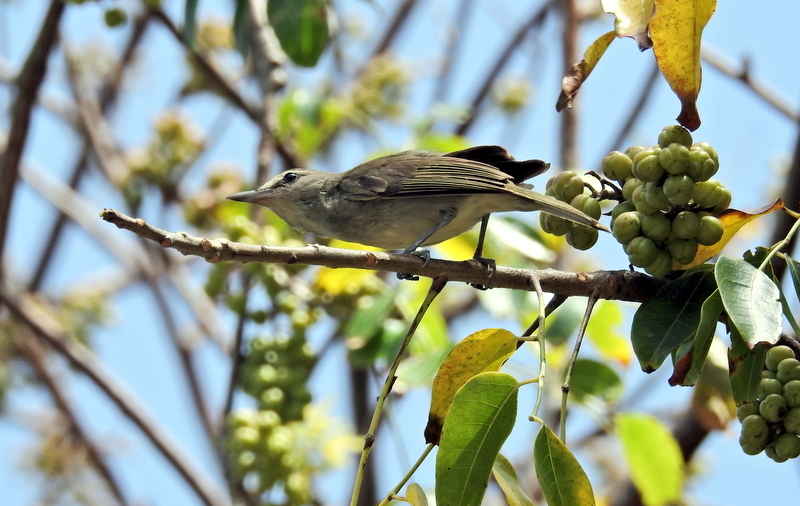 The Yucatan Vireos on the islands of Cayo Cochino are the only ones you will find in Honduras. From Cayo Cochino Minor (or Turtle Island as the locals call it), we crossed the straight to Cayo Cochino Major, where we landed on a private beach to explore inland for the Rosey (or Island Hog-nosed) Boa. These snakes are sometimes abundant, draped in trees, back a few hundred yards from the beach. Though it was a hot day and the snakes were mostly higher in the canopy, Elmer located one for us, curled up on a branch just above eye-level. We eventually found our way back to the beach for morning snacks, water, and wading (this beach is near the spot were we would have gone snorkeling if any of us had wanted to.) The beach sloped gently out into Turtle Bay, and it was a real treat to wade out into the crystal clear waters of the Caribbean. 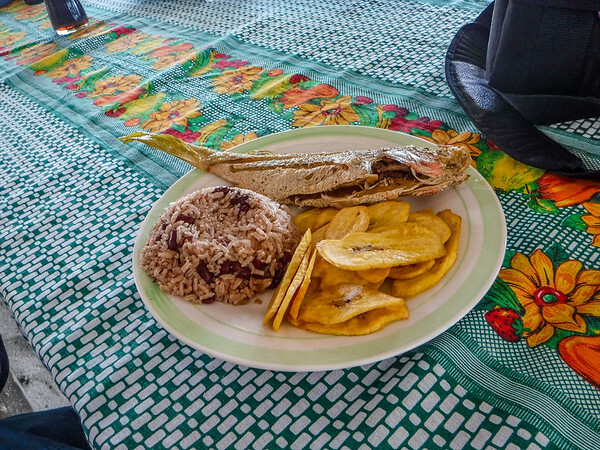 tailed Snapper, rice and beans, and fried plantains. That is the whole menu, and all meals are served on paper plates right on the beach under a thatched shelter at rough picnic style tables, but it just might be the best fish you will ever eat. While you eat you can watch the Frigatebirds and Pelicans soaring in the updraft at the head of the island. 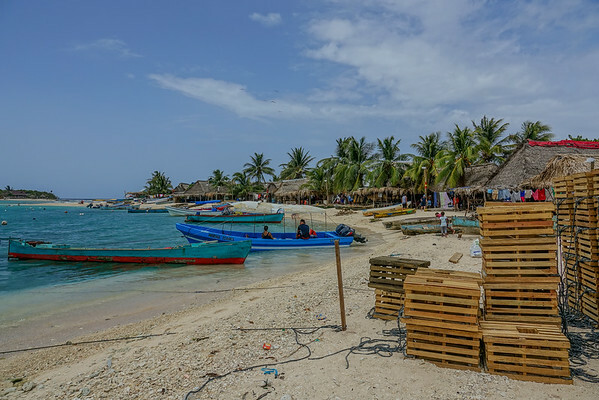 Except for the open beach on one side, the whole island, which is maybe the size of half a football field, is covered with the shanty homes of the fishermen. Their meals are so famous that boats come daily at noon and in late afternoon and early evening from the mainland and from the bay islands 25 miles away. (And of course fire-wood, rice, beans, plantains, and ice…lots of ice…have to be brought out to the island in dugout canoes daily.) 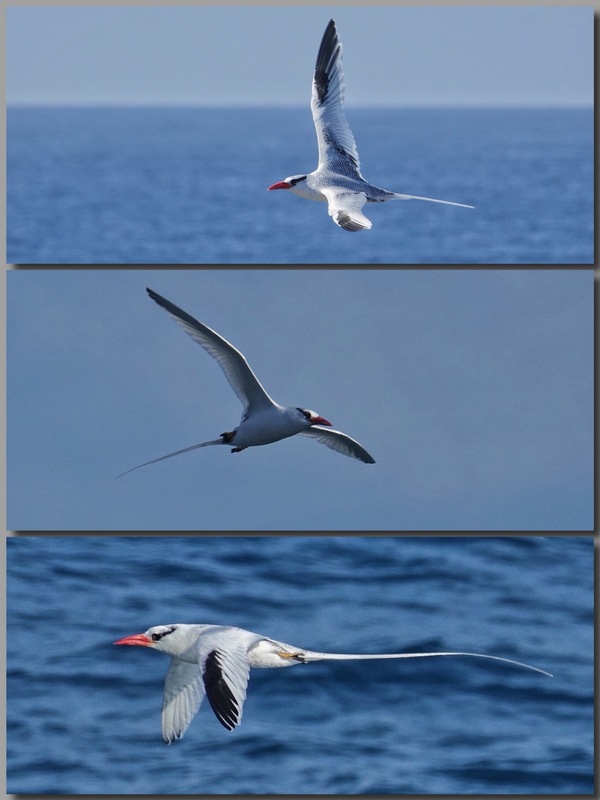 After lunch, we spent about 45 minutes, mostly trying flight shots of the soaring Frigatebirds and Pelicans. There are only a few places I can think of that are this good for practicing flight shots. On the way back through La Ceiba on our way to the Lodge, we stopped at a small park where Black and White Owls are known to nest and roost. Again, Elmer managed the impossible and located one of the young B&W Owls on branch high in the canopy of one of the huge Mangostein trees. While we were photographing the young owl, Elmer’s friend, who used to work at the park, located one of the adults, and we moved the group over. Both owls were in the deep shade of the foliage, high in the trees, and, though they were in plain sight, they were not easy photographic targets. We were looking almost straight up at the them in the shadows. The situation was really at the limits of what any camera can do…the light was not good, and focus was difficult…and we were at the limits of what our bodies could do as well, as we tried for awkward vertical shots at slower than optimum shutter speeds. The situation called for a tripod, but for the kind of 8 foot tall tripod no one would ever carry into the field anyway. Still, everyone in the group came away with at least one satisfying shot of the Black and White Owls. Our last full day in Honduras found us on the bus early again for the drive to Lancetilla Botanical Gardens, the turn of the century Botanical Research Station founded by the United Fruit Company to experiment with tropical hardwoods and fruit trees for growing in their Honduran holdings. Lancetilla has the longest bird list of any single location in Honduras. It is also a great place for butterflies and dragonflies, and the occasional mammal. A day at Lancetilla begins with a walk along the entrance road and one side road in search of mostly understory birds. We had not progressed far long the road when Greg spotted a Mexican Hairy Dwarf Porcupine on the branch of a tree just at the edge of the rainforest. (Also, apparently, known as a Prehensile-tailed Porcupine or Tree Porcupine.) Like most Porcupines its body is covered in spines, but in the Hairy Dwarf, its fur is long enough to completely cover the spines on much of its body, leaving spines exposed mostly on the face, lower legs, and spine. We had as much time with it as we wanted…since it was not at all disturbed by our presence on the road. Our pictures are remarkably similar as it did not move much beyond an occasional scratch for fleas. Early on we also encountered Groove-billed Ani, Blue-black Grassquit, Thick-billed Seed-finch, Olivacious Piculet (the smallest woodpecker of the tropics), Passerini’s Tanager, many dragonflies and few butterflies. The second stop on the way in is a giant hardwood tree that hosts upwards of 100 active Montazuma’s Oropendola nests. 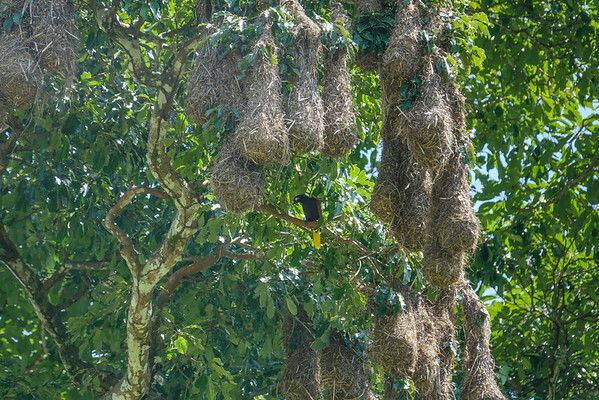 The Oropendolas are the largest of the oriole family, and construct huge hanging woven basket nests. Just beyond the Oropendola tree there is a trail down to the river, which is always worth checking for Jacamars and Ruddy Crake. Neither turned up, but I photographed some interesting butterflies, the first of many that day, while we were waiting. Several of these are from later in the day, around the Visitor Center, which was our next stop. Though Elmer set up and played his recording for the Ruddy Crake we heard calling in the tall reeds along the trail, it did not make an appearance. 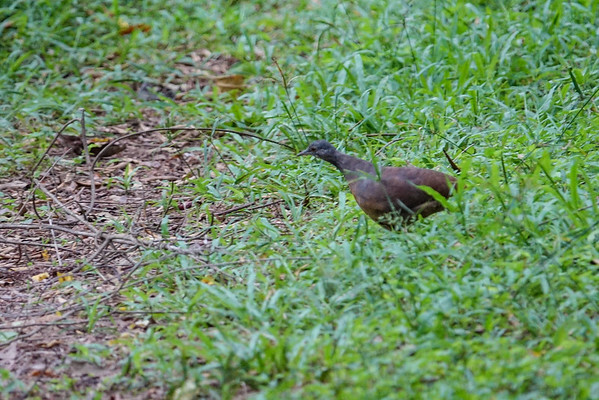 Ruddy Crake is not uncommon, especially at Lancetilla, but it is very difficult to see. At the Visitor Center we spent some time with the natural history displays on the second floor, and then retired to the deep shade of the bamboo grove. Many different varieties of bamboo from around the tropics grow along a little stream that runs through a hollow. There is an amphitheater with a small stage there for presentations, but the main attraction is still the massive clusters of the largest grass in the world. I generally get the group together in the grove for a photo. While in the bamboo grove we came across a toad, and the whole group gathered to try toad shots. 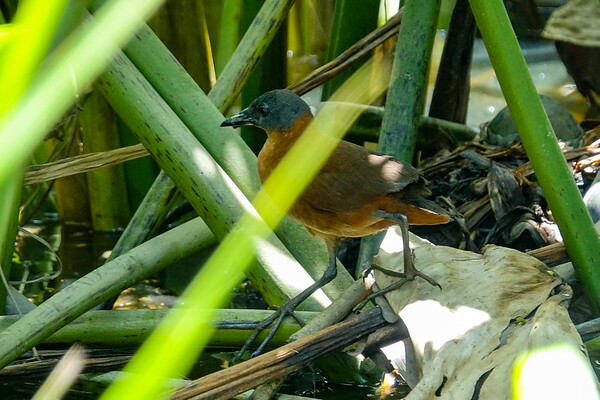 Before getting on the bus to head to Tela, a beach resort town near the gardens, for lunch, we made one last try of the Ruddy Crake. There are a series of small lily ponds along one side of the Visitor Center, and a Crake responded to Elmer’s recording almost at once. The rest of the group went around to the far side of the ponds where the Crakes were calling (there were at least two) but I got distracted by some shade and butterflies along the other side and headed that way. Consequently I was in exactly the right spot to see both Crakes cross a small open patch in the dense growth covering the pond. Most of the group got glimpses of the Crakes, but I got photos! Of course I could not resist the dragonflies around the ponds either. I do not know enough about Central American Odonata to id these. After the Crakes and Odonata we were back in the van for the short drive to Tela, where had a delicious lunch at a sea-side hotel. 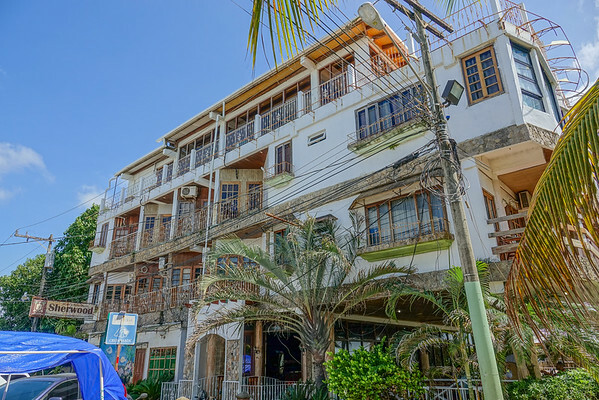 Tela was the resort town back in the days of the United Fruit Company, and still maintains its charm for Honduras today. That left only the morning of our departure at the Lodge. 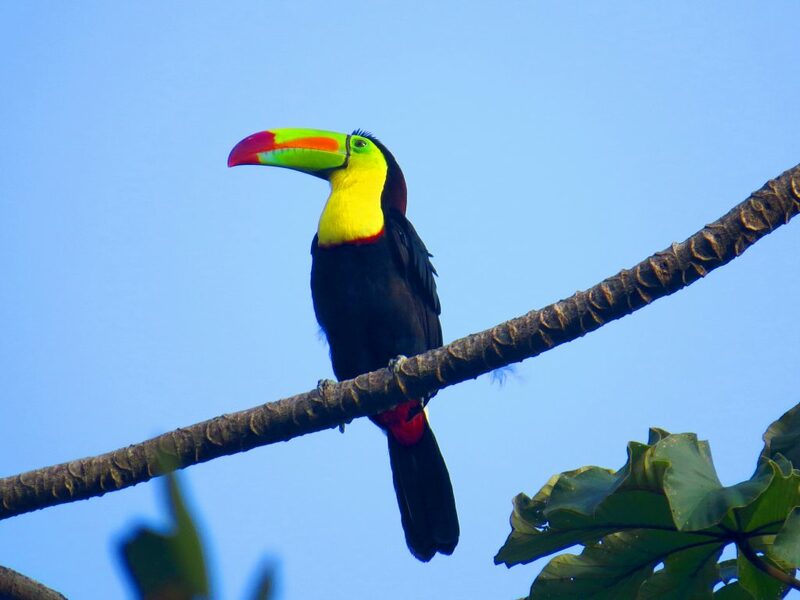 Just as we finished eating breakfast a Keel-billed Toucan flew in over the Conference Center. Greg had the persistence to wait it out until it posed on an open branch. It was an amazing satisfying trip. We had time (mostly in the van on the way to shooting sites) for some discussion and photographic instruction. We had abundant opportunities for tropical photography. We had great times around the tables at the restaurant on the veranda at the Lodge (not to mention great food). And we had great weather. Though it rained every day, it never rained on us in the field. For the most part we had sunny skies and good photographic light when it mattered. The tropics are always a challenge for any photographer, but our group proved that today’s advanced superzoom Point and Shoot cameras are up to the task. I am already planning another trip to the Lodge at Pico Bonito for next June (the 16th to the 22nd) …and I have a trip to Tranquilo Bay, Panama (another great destination) in the works for 2017. I am thinking of South Africa for 2018. Watch the tours and workshops page on this site for details.